Gullskoen (1996). 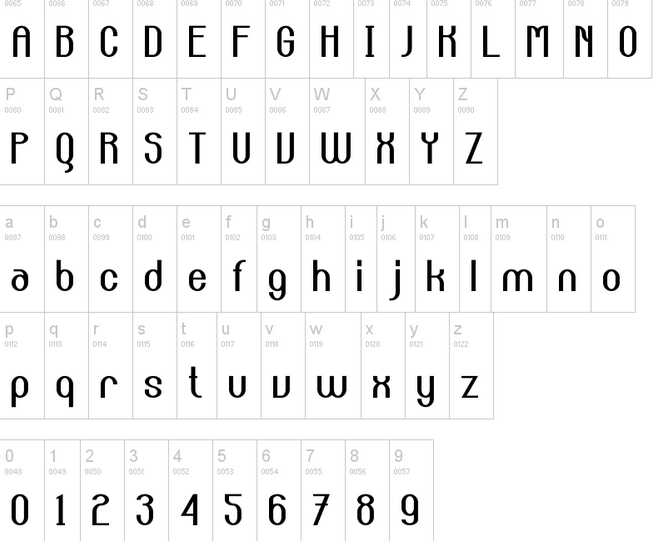 The font Gullskoen contains approx. 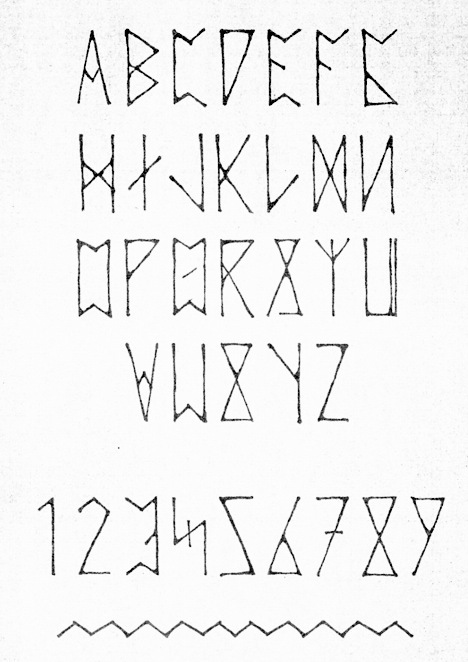 150 characters from the younger rune alphabet: the main forms and some variants of the long twig runes, the short twig runes, the staveless runes, and the Nordic medieval runes (including forms from Gotland, Iceland, and Greenland). 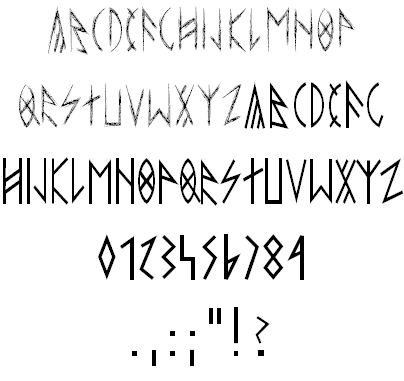 The font does not represent a single futhark, but contains runic forms from a wide geographical area and from a period of several hundred years. The largest number of variants are Norwegian. ullskoen is named after one of the buildings on the wharf (Bryggen) in Bergen. After the fire in 1955, a large number of inscriptions in the younger runes were found in the grounds here. Gullhornet (2001). 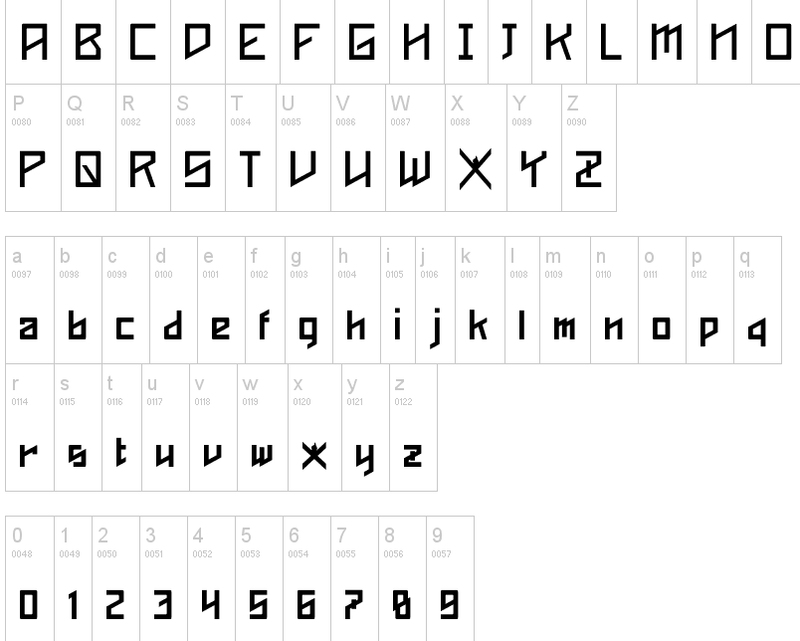 The font Gullhornet contains 109 characters from the older rune alphabet, both common Germanic runes and Anglo-Saxon and Frisian ones. In addition to the approx. 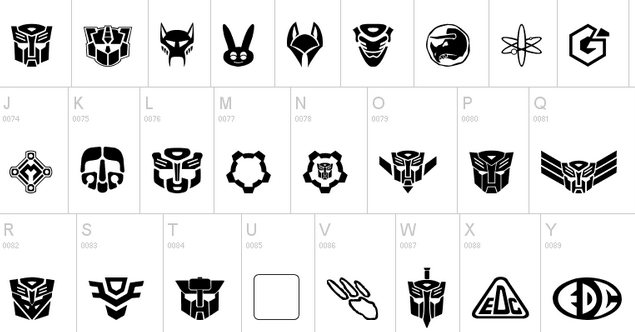 40 standard characters in these futharks there are approx. 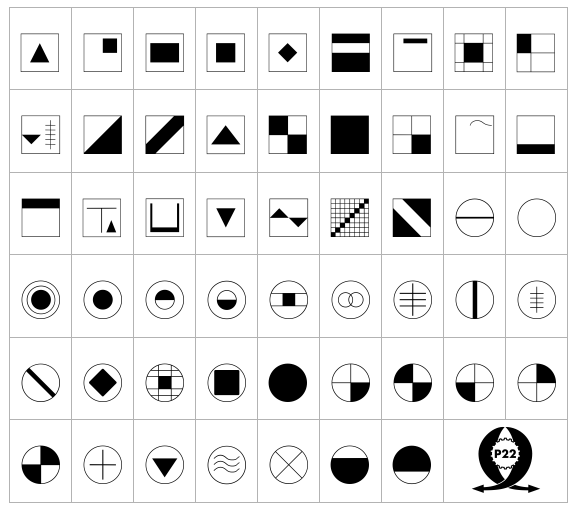 60 variants and 9 signs for punctuation and diacritical marks. 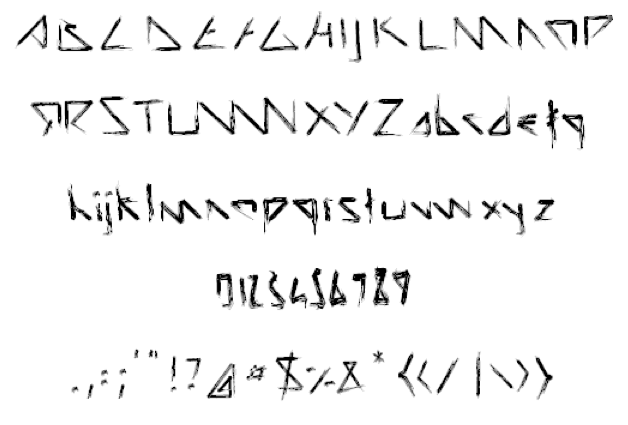 Gullhornet is named after one of the best known Danish inscriptions in the older runes, found in 1734, later stolen and lost, but documented through drawings and copies. 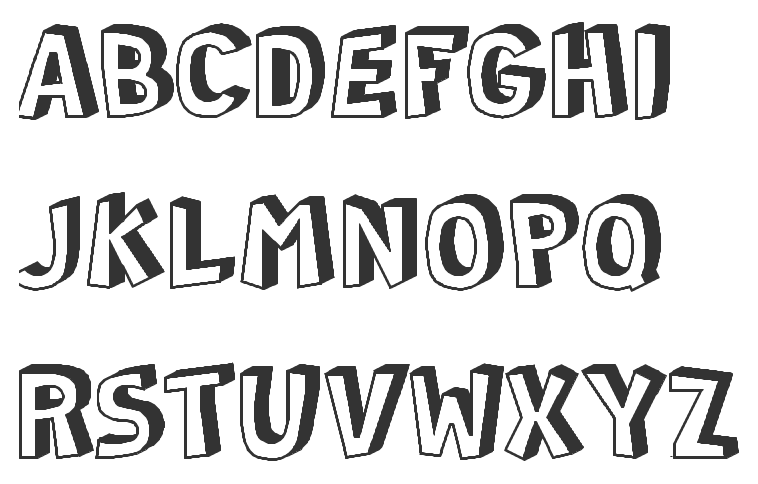 Freeware fonts by Eric VanDycke from Warnerville, NY, aka Dr. Nimbus. Original and very very enjoyable creations from 1997-1998. The site was closed in March 1999, unfortunately! Thanks to CybaPee, you can download the whole collection now. 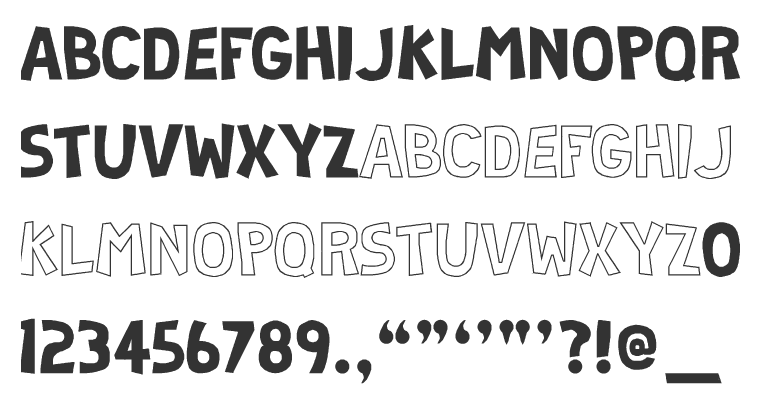 Typefaces: OmegaSwirls (a neat collection of spirals and swashes), Curbature (an earthy outline font), SpahrtyGirl (1998, a great curly typeface), Shamantics (music-inspired), Doodle Dudes of Doom (funny dingbats), BirthdayBats, Big Ham, Black Shirt Slime Trail, Bazzomba, Big Blocko, Androganamous, 52 Spheroids, Vadim'sHand, Tom'sWriting (nice), Kim'sHandwriting, Jennifer'sHand, Fanny's Treehouse, Chris's Handwriting, Armageddon, Awl Scrawl, Kim'sToons, Max's Handwriting, Frog Mess 1 (by Froggie), and Frog Dings 1 (by Froggie), Halloween Boosta, Blottooo, Border Bats, Death Valley, Runes of Omega, Retrobats, Pittoresk, Runes of the Dragon, Cthulhu Runes, the fantastic DocNimbusBats, SpaceWooziesExtraz, Oriental Patterns, OldTimeAdDings, MonsterMasher (to make a monster font), Monsters of Stone, Garden Dings, DaFunkBrothers, Cultural Icons, Celtic Patterns, Celtic Frames, Cerbature, Callallied, Callaxis, Asian Dings, 52 Sphereoids (very original), gothic hijinx (phenomenal! ), Spazzz Caps, Oogie Boogies, XRayTid, XXonXXoff, SwampType, Speedy12, SlapHappy, Kaptain Kurk (OK font! ), jaunty, GrungePuddles, Frankendork, Evil Signature, Elevator Buttons, Chewed Straw, Chilly Moe, 4 Star typeface Font, Amosis Technik, Space Woozies, Schizoid Trout, Halloween Border Bats, Bloody Stump (dripping blood face), BubblyFrog, Cathzulu (+Hollow, +Extraz), Chunk-o-Muffin, Kallamar, Lyarith (curlies! ), PsiBorgZ, Purple Burple, and Quasidipitous. Illustrator, painter and occasional type designer in Bandhagen, Sweden. He created Futhark, Bent (2010), and Lined (2009). 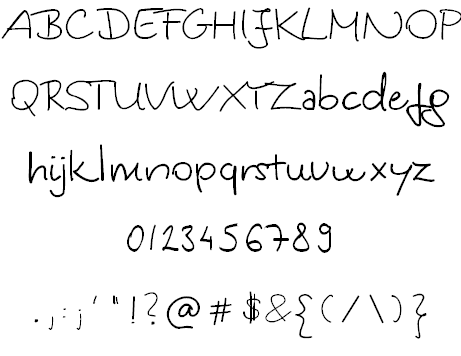 Via MyFonts, one can buy Lined. 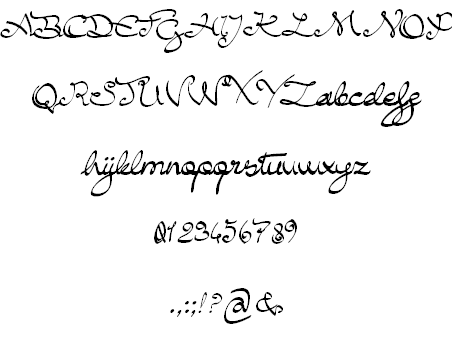 Brazilian designer of Tengwar v.3, v.4 and v.5 (1994). Reykjavik, and Akureyri: For the transliteration of Old Icelandic manuscripts. 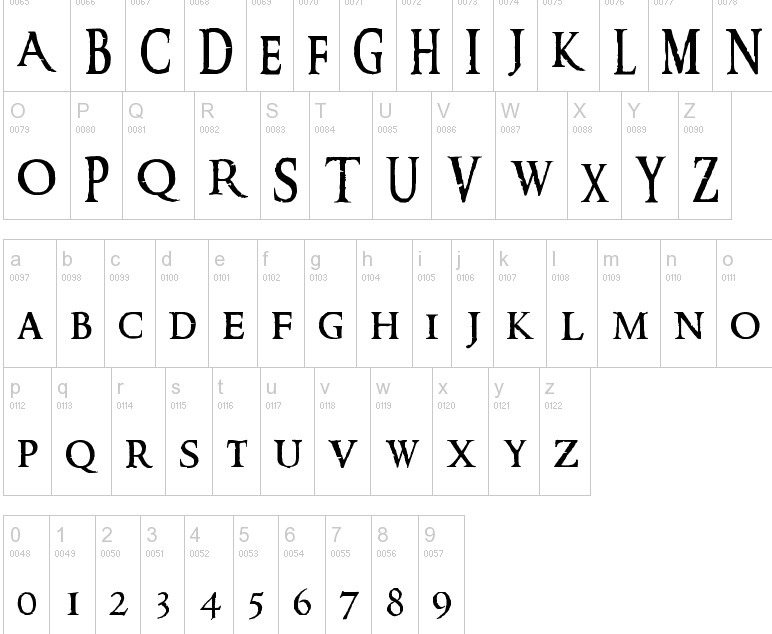 I-E Font 1 through 4: For Indo-European comparative linguistics. 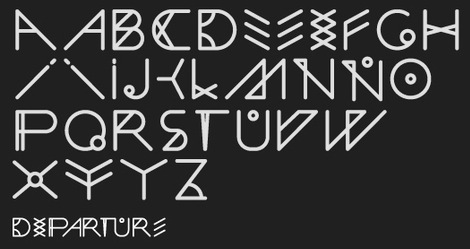 Stentoften: an advanced runic font. 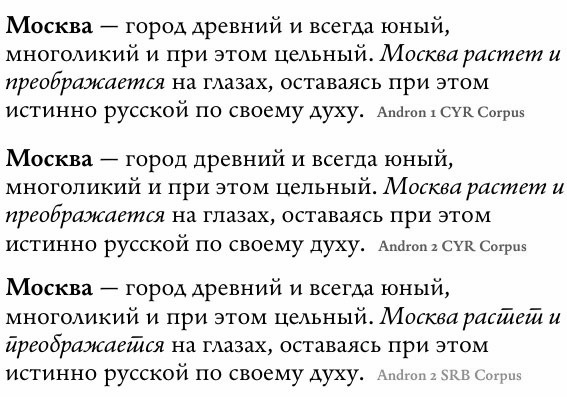 Latinskij historik: A Cyrillic font that includes symbols useful for work in Slavic historical linguistics. 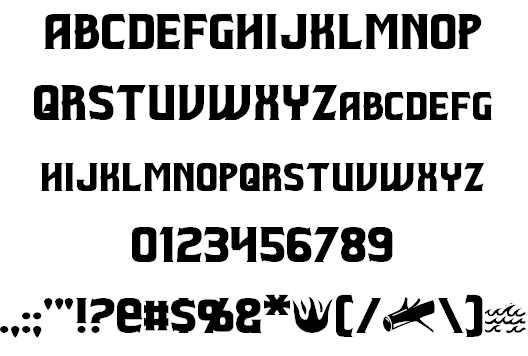 Pete "The Hutt" Klassen created the "Lord of the Rings" movie logo font, Ringbearer Medium (2002), as well as Aniron (2004), an uncial typeface that was used in the credits of the same movie. See also here and here and here. There is also a small rune archive. Peter Rempel (b. 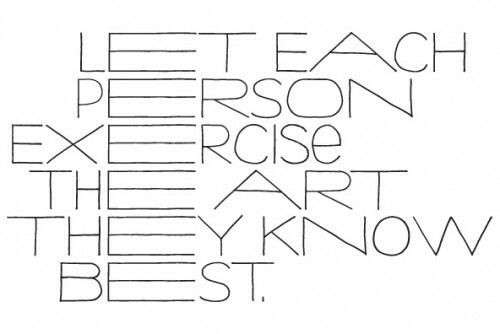 1958) is a Winnipeg-based calligrapher. 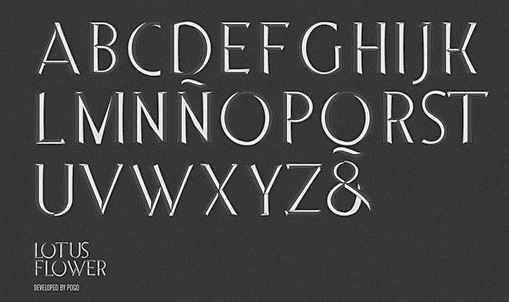 Nice graphic about classical roman types. 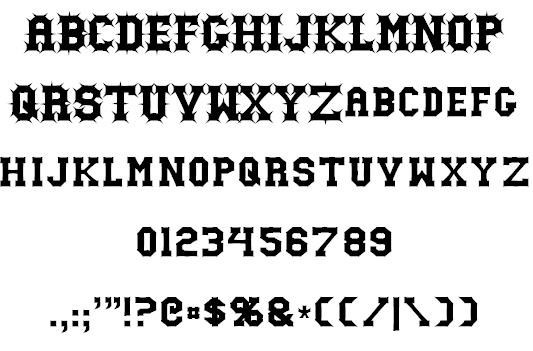 He designed some exquisite shareware fonts: PR Uncial Creepy (2010), PR Agamemnon Bold (2008), PR-Uncial (2003), PR-UncialAltCapsExtended, PR-UncialAlternateCapitals (1998), Demo-ofGabrielCondensed, Demo-ofGabrielRegular, Demo-version:Gabrielextended, PR-CelticNarrow (1998), Magickal Signs, PR Runes (2000), PR Rune Stones (2000), Pi Rho Runestones (1998), PR Astrological (1998), PR Compass Rose (2007), PR Viking (2007; +Alternates) and Pirho Herakles (1998, an Etruscan-style or Greek simulation font). In preparation: PR Alchemyst, PR Snaggly, PR Monk's Holiday. 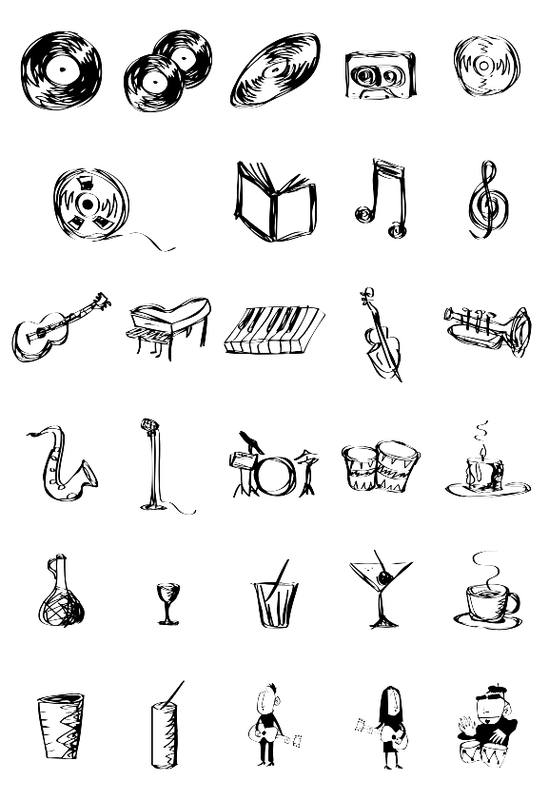 He writes about himself: educated in music composition and visual design. In his family home, there were many wall plaques with German Bible verses, rendered in a variety of gothic and fraktur lettering styles. 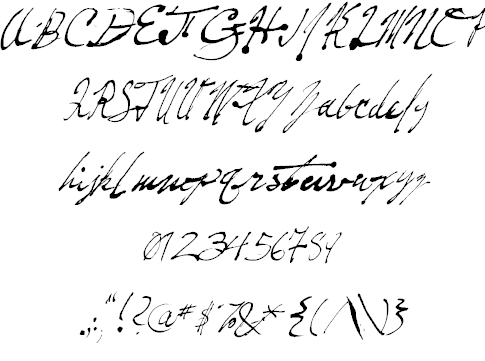 In the 1980s he discovered the art of calligraphy, first through the speedball lettering textbook, and later by joining the calligraphers Guild of Manitoba. 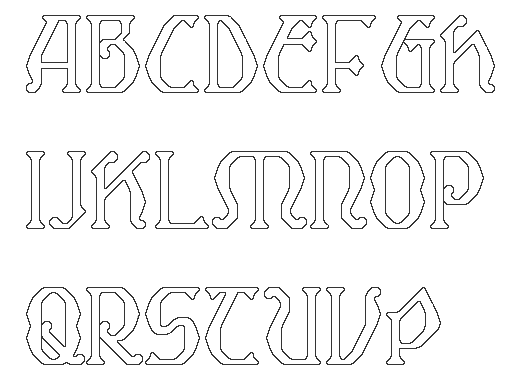 He has studied a variety of lettering styles, but his strongest interest is in the letter styles of the Middle Ages, starting with the German Fraktur styles he knew from childhood, and extending back, into uncials, runic shapes, and the Classical Roman Letter. 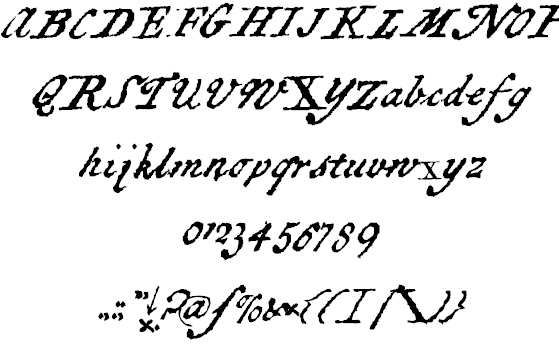 The Chancery cursive, or Italic hand, which to many people is synonymous with calligraphy, never held much interest for him. 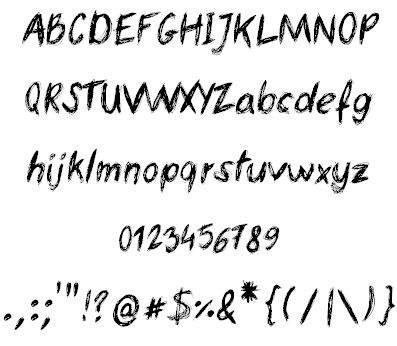 He released his first shareware fonts in 1996. In 2010, he went partially commercial. 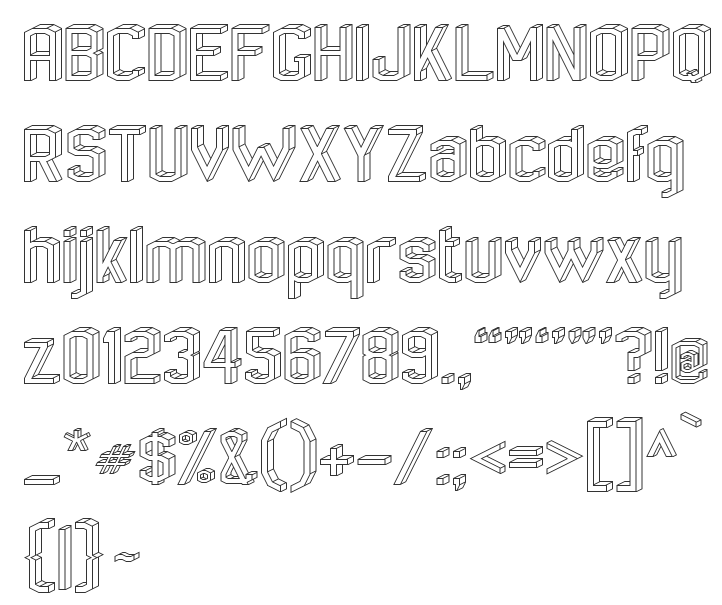 His first pay font is PR Pointers (2010, an arrows font). In 2011, he designed the commercial typefaces PR Mapping and PR Stars. 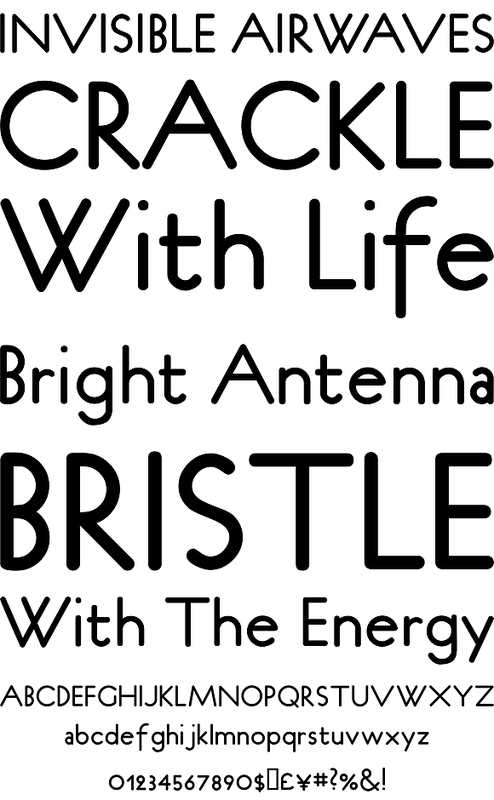 In 2012, he published PR Arco (arcs for framing curved lines of text, in a style common on Victorian posters and almanac covers) and PR Hydra (a Greek simulation font). 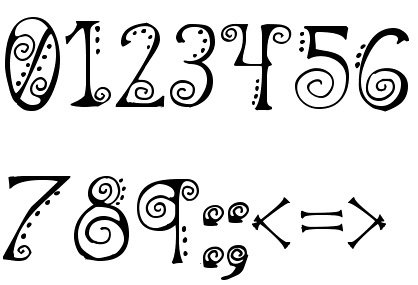 Typefaces from 2013 include PR Snowflakes 01, PR Bramble Wood 1 and 2, PR Valendoodle 01 (Valentine's Day ornaments), PR Swirlies (in series numbered 01 through 13), PR Swirlies Frames, PR HallowDoodles (Halloween dingbats), PR Nouveau Ornaments (art nouveau), PR Viking (a rune simulation face), PR Foxtail 01, PR Foxtail 02, PR Scrolls 03, 04 and 05 (2014), PR Sprucewood (2014), PR Swells One (2014), PR Xmas Doodles (2014), PR Hearts Take Wing 01, PR Mysticon 01 (star dingbats), PR Pointers 01 (arrows), PR Valknut (Norse god symbolism), PR Scrolls, PR Uncial (1998), PR Dim Sum (brush face), PR Columban (a Celtic uncial, named after Irish monk Columbanus), PR Columbian. 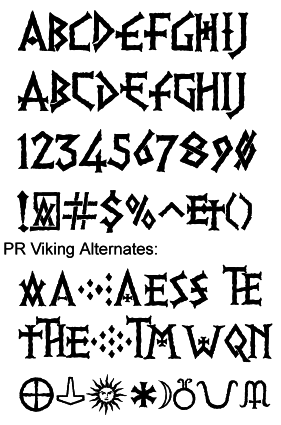 Typefaces from 2014: PR Cauldron (a scary Celtic style font), Vanaheim (a flared display typeface influenced by Nordic runes). 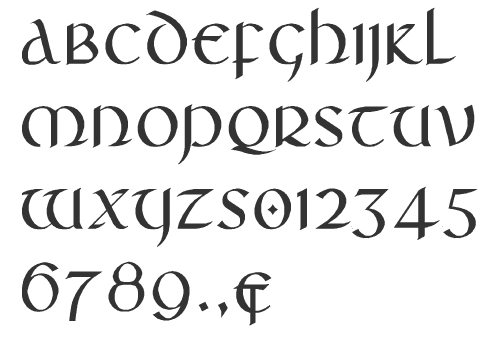 Typefaces from 2015: PR Hallow Doodles 03, PR Ex Cathedra (Trajan capitals). 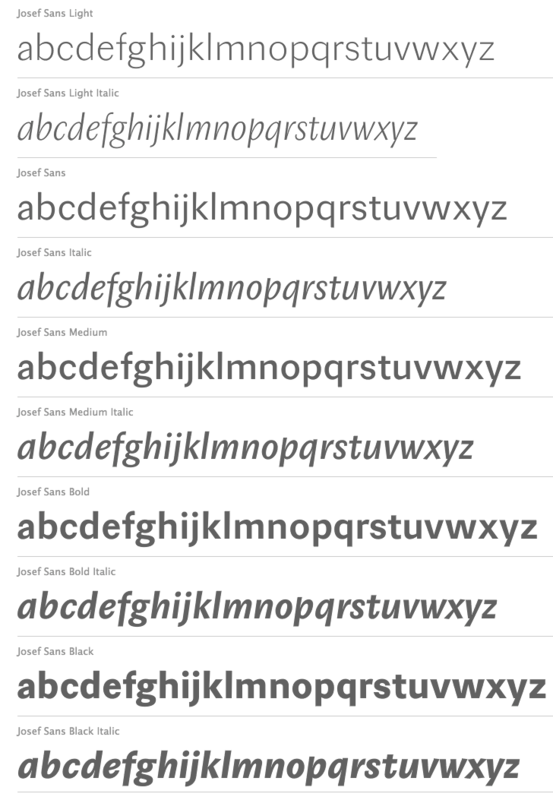 Designer at the Open Font Library of Beorc Gothic (2015), a runic font family with a design inspired by the European sans-serif typefaces of the 19th and 20th centuries. 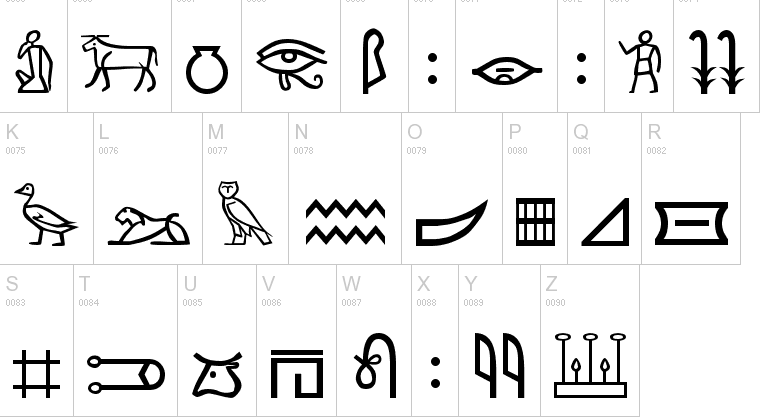 It contains a full implementation of the "Runic" block of Unicode 7.0, as well as Arabic numerals and many useful punctuation characters and symbols. Github link. 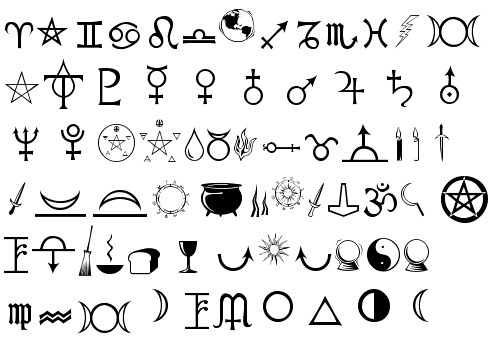 In 2015, he made Raidho Theodings (Open Font Library), a free font with religious and magical symbols. 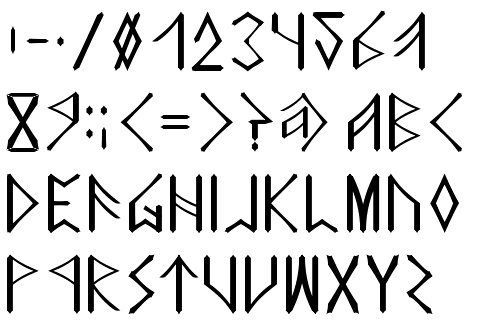 In 2016, he created the Anglo-Saxon runic font Bramham Serif. 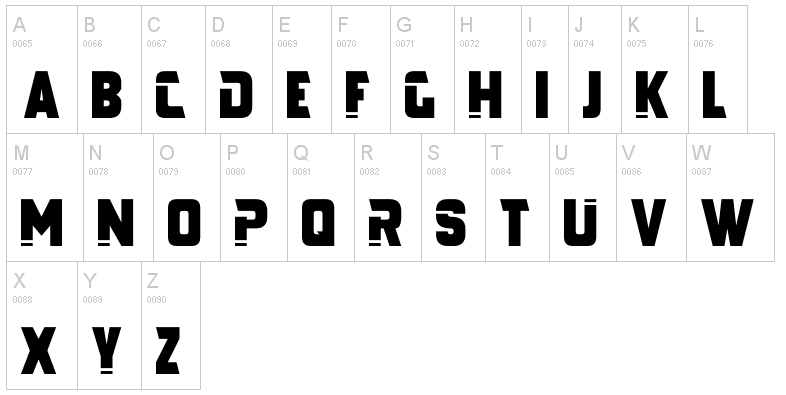 Aka p2pnut, b. Wales, 1943, who started making fonts in 2009 at FontStruct. Alternate URL. Dafont link. Klingspor link. 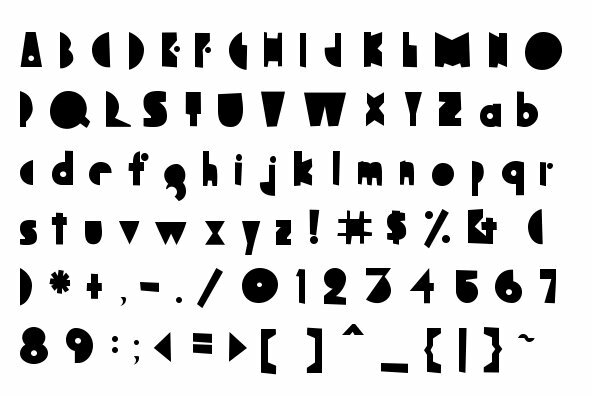 In 2010, Ray Meadows set up shop at MyFonts. 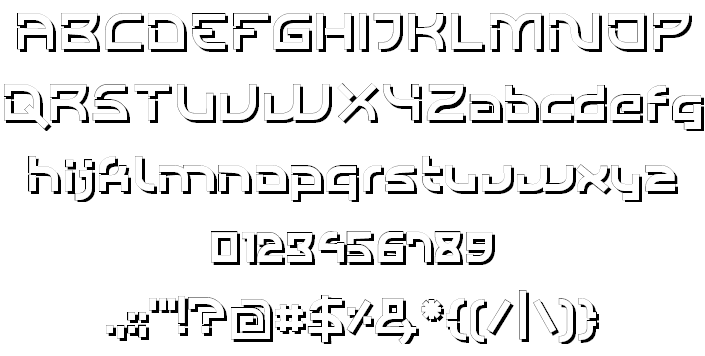 Prolific creator at FontStruct in 2009 of the 3d typefaces Alphabox, Alphabox Reverse, Alphabox Lite, Alphabox Lite Complete, Alphabox Shadow and Alphabox Basic. He also made RM Playtime (outlined 3d family), Art DECOrated, Single DECOr, Romantic (+Carved, +Carved Shadow), TripleDECOr, New Romantic, SOFA, Mondrianish, Eye Test, Meltdown (grunge), Ameslan (American Sign Language), DECO Noir, DECOction, DECOserif (+Bold), DECOoction (+Bold Open), DEChrome, DECOpix, DECOr (a pure art deco typeface like Levine's Art Lover JNL), DECOThin (+Medium), Scrapheap, Westward (Far West font), Cheese Fondue, Alphabox Reverse (shadow font), AlphaRune, Spaced, Gothicky, Grand Prix, Entrees (alphadings), Compround, Phatzzo (nice! 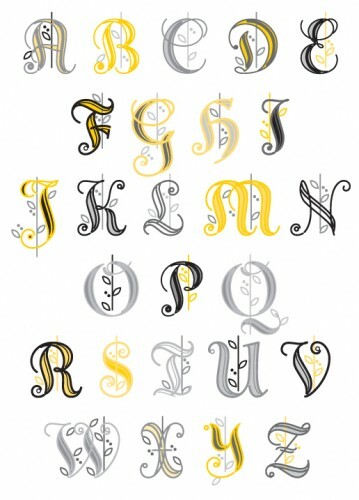 ), DECOr8, Gothicky, Gothicky Grey, RM Ginger, RM Albion (blackletter), and Opening (outline face). 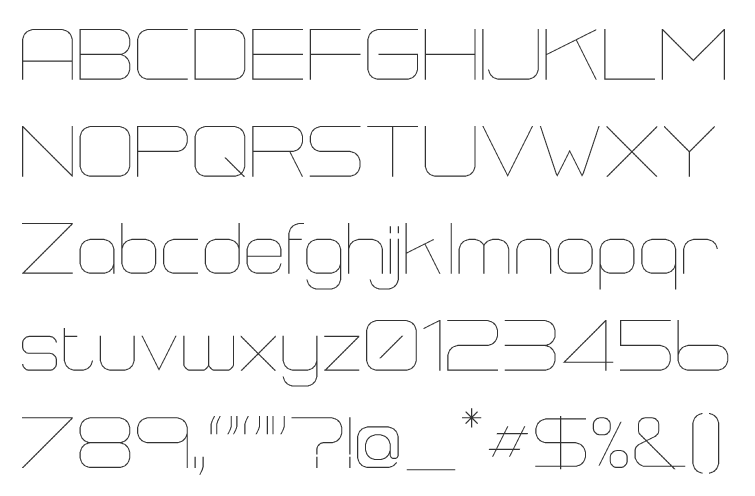 RM Squarial (2009) is a hairline sans. 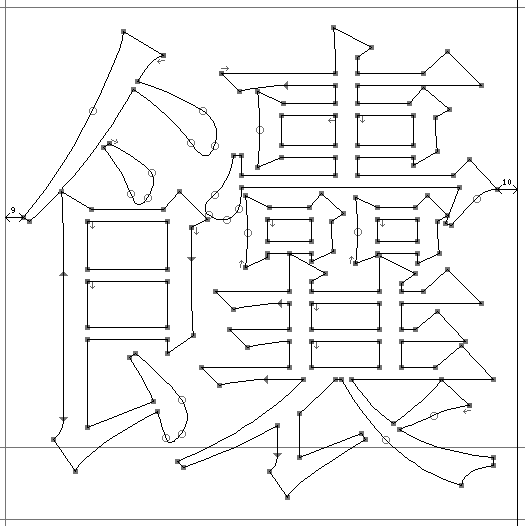 Its 3d version is RM Squarial 3D. 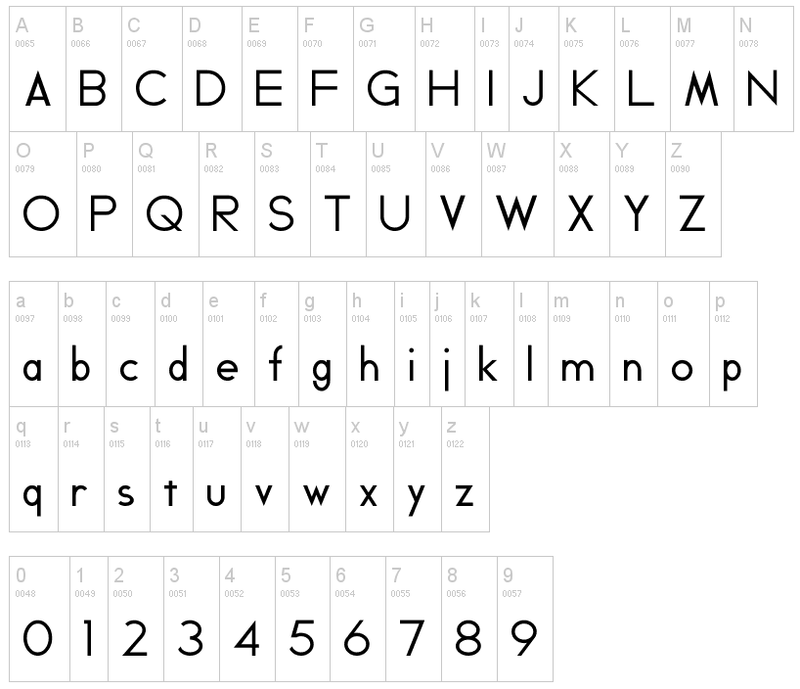 RM Typewriter (2009, +Medium, +Bold, +Old) is an old typewriter face. 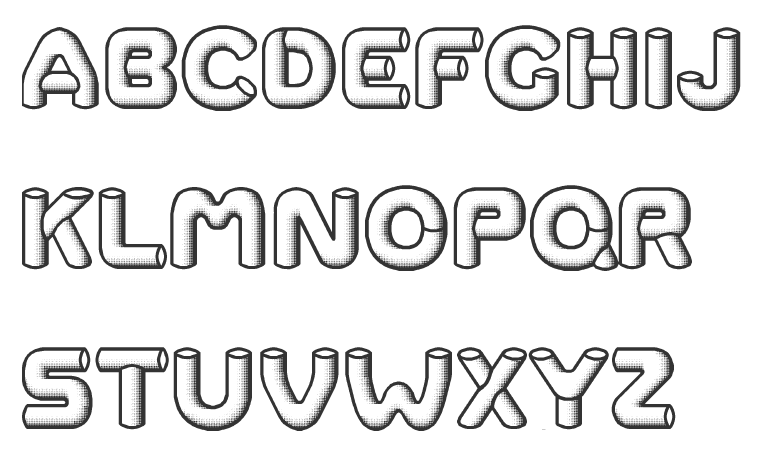 RM Serifangle (outline art nouveau face, +3D, +Chrome, +3DChrome) and RM Corrugation (postage stamp, white on black style) are both interesting. 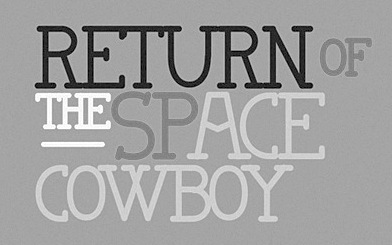 RM DECO Serif (2009) is in the RM Typewriter style series. 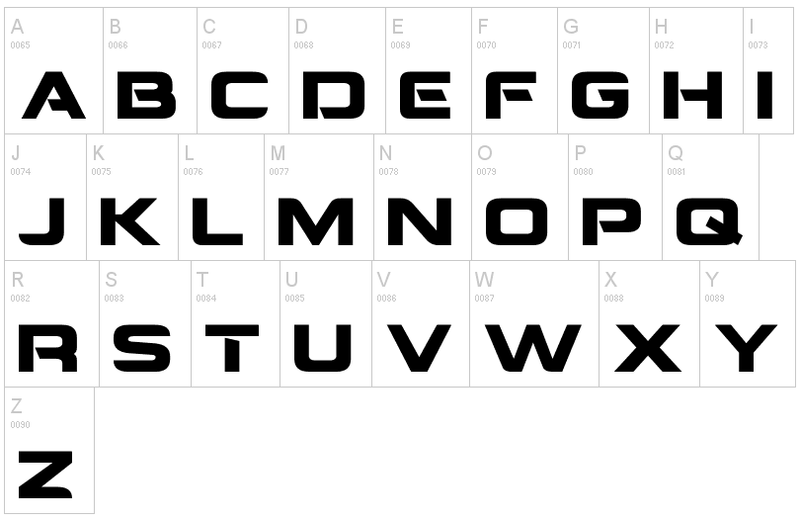 RM Bowie Basic is a futuristic typeface based on the typeface used on Mars in "The Waters of Mars" (2009). 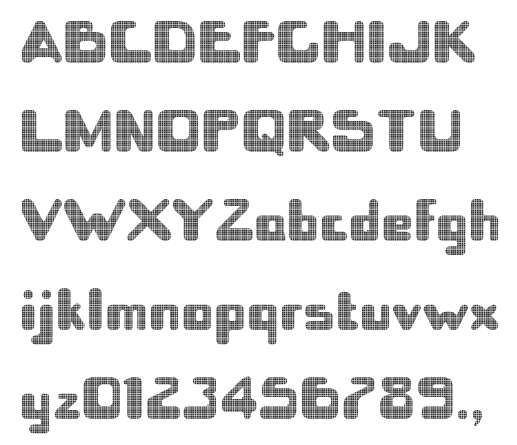 RM Playtime Stencil (2009) is a rounded stencil typeface based on RM Playtime Solid. 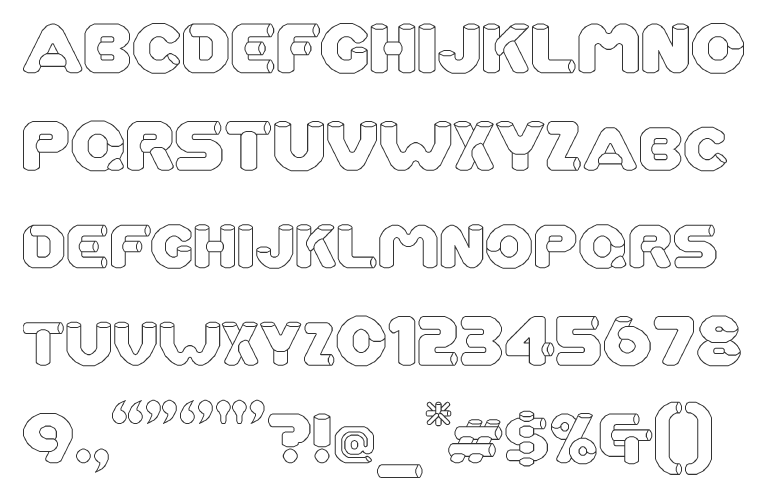 There are more styles such as RM Playtime 3D. 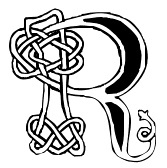 Additions in 2010: RM New Albion (blackletter), RM Lined, RM Serifancy (Western face), RM Almanack (+Old), RM Tubeway (+Chrome), RM Thinny, RN White Letter, RM Blacklet, RM Squarial (+Ribbon, +3d), RM Typewriter Old, RM 7even, RM SideSlip, RM Teeny, RM Teeny 1.5, RM Narrowboat (+3D) (athletic lettering). 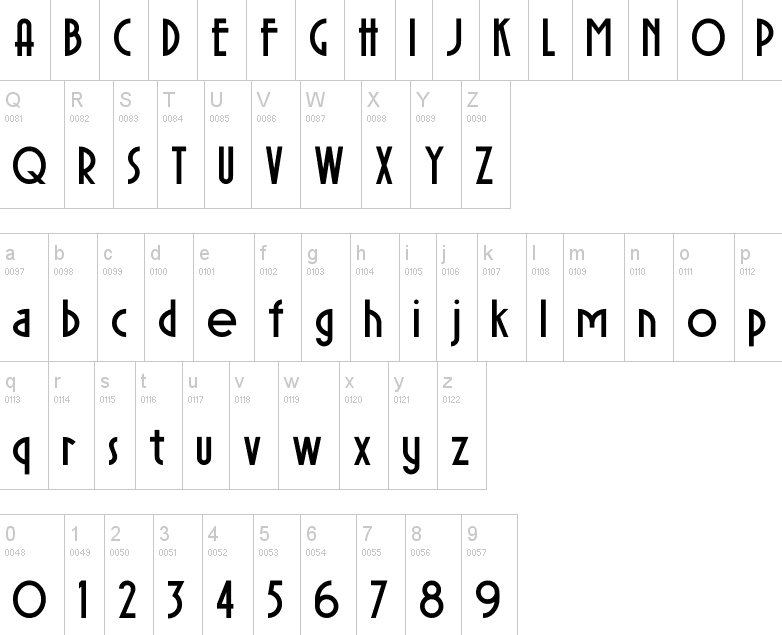 Creations in 2011: RM Celtic, RM Uncialic (+RMWL Uncialic: Carolingian), RM Opensans, RM A Sign of the Times, RM Sans, RM Oliver (bold rounded sans), RM Soft Sans (wonderfully round sans), RM True To Old Type (old typewriter), RM True to Type (new typewriter), RM Middy, RM Phatso (textured), RM Phatso 2.0, RM Phatso 2.0 Solid (texture typefaces). 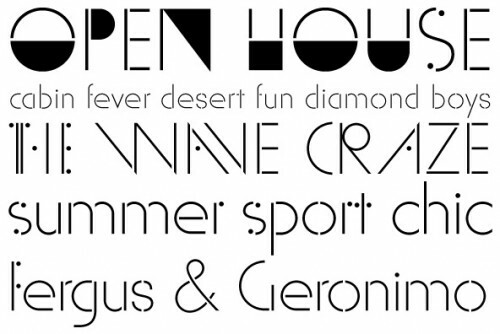 Creations in 2012: RM Luceat (a bullethole typeface), RM Jazz Age, RM Basic Serif (roman face), Alphabox (a 3d family: +Reverse, +Lite, +Reverse Stencil), RM Slab, RM Slabb, RM Tubes (3d typeface), RM Smoothsans (rounded sans), RM Romantic Carved (+Shadow: a beautiful set of beveled typefaces), RM Westward, RM Typerighter, RM Uncorrugated, RM Snowtime, RM Smooth Jazz, RM Smooth Age, RM Nova Albion (blackletter), RM Tubes Chrome, RM Squarial FS10, RM Basic Serif. 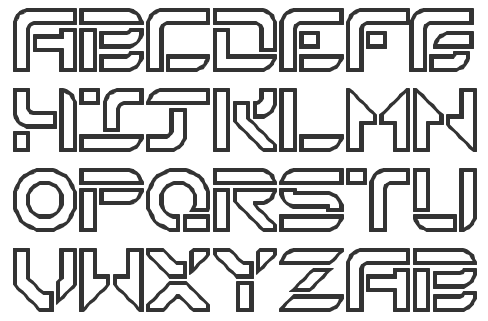 Typefaces from 2013: RM Bloc, RM Greek, RM Victoriana, All Bricks, RM Deco, RM Random Outline, RM Random 3D, RM Random (cartoon face), RM Celtic Condensed, RM Westus Condensed, RM Westus (Western, spurred), RM Hunky (chunky and modular), RM Thunk (piano key face, thick and chunky), Westward Ho (spurred Western face), RM Hangle (chuunky and elliptical). 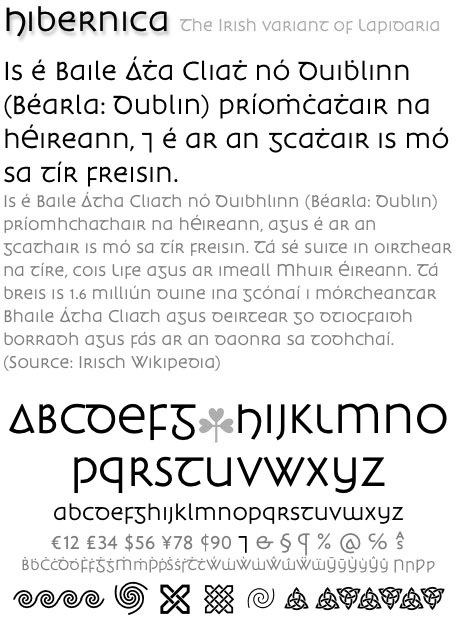 Typefaces from 2014: RM Firmstone (+Outline, +Condensed, +Outline Condensed), RM Ebdon Outline, RM Imber Outline, RM Moss Outline, RM Imber, RM Art Decorated, RM Celtic Inline. 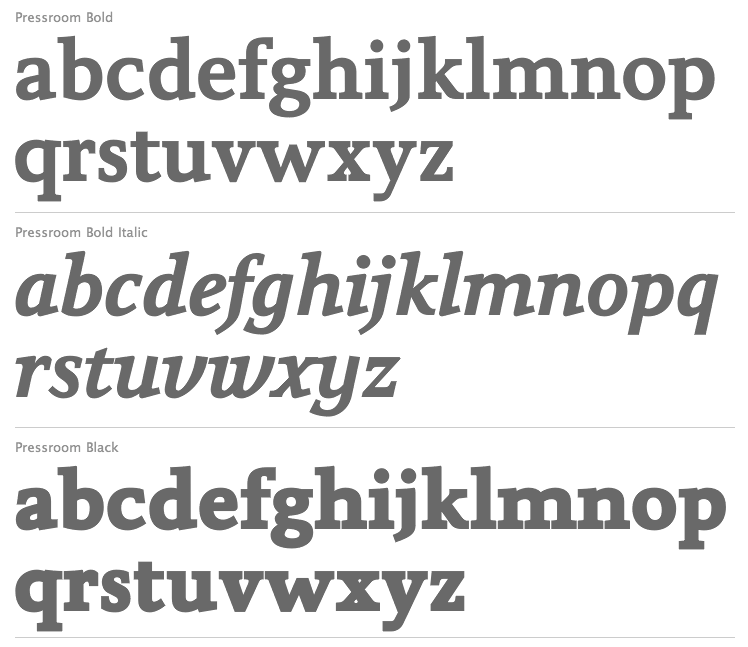 Typefaces from 2015: RM Deco, RM Stoney, RM Mondrianish, RM Stoney Shaded, RM Middy, All Bricks, RM Shepherds. 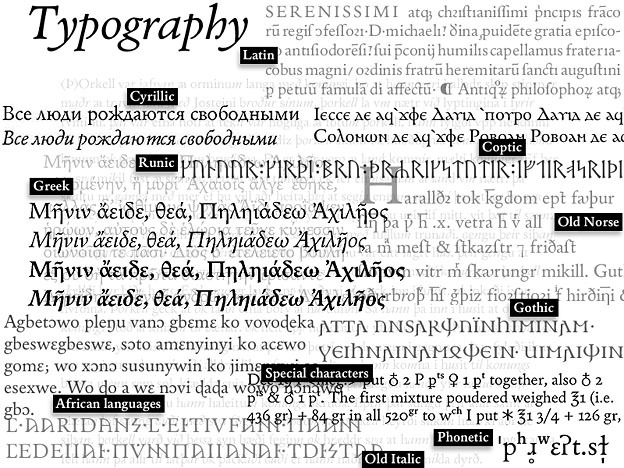 Designer at FontStruct (aka Riccard0) in 2009 of Noptical (+Short, +Narrow, +Compact, +Elder, +Round, +Wide, +Tall), Rough Vut (outline face), Semiserio Linea, Snake's Tongue (Tuscan), Angul (runic), Elegance (+Serif), Black Agate, Black Diamond, Maccheroni. 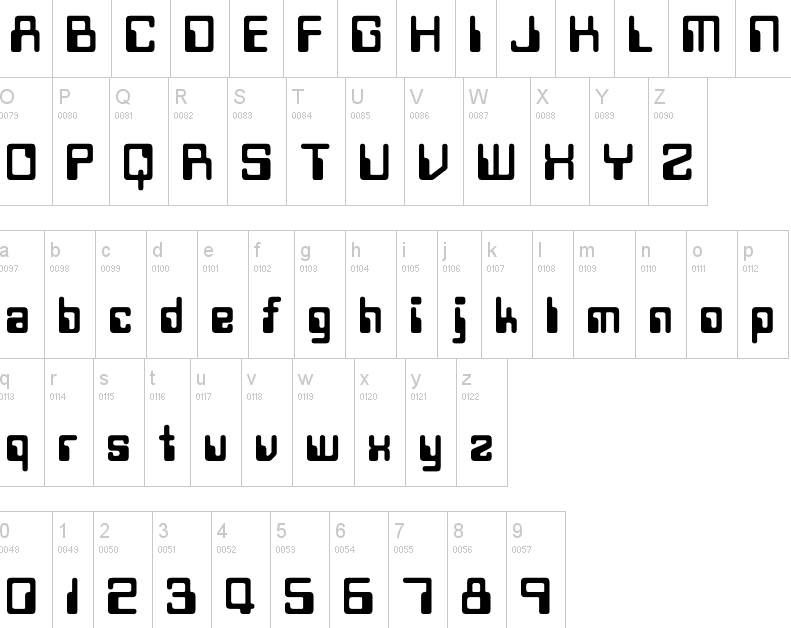 In 2010, he added Amanuensis (blackletter) and Claredont (like Clarendon) and Claredont Stencil (2011). 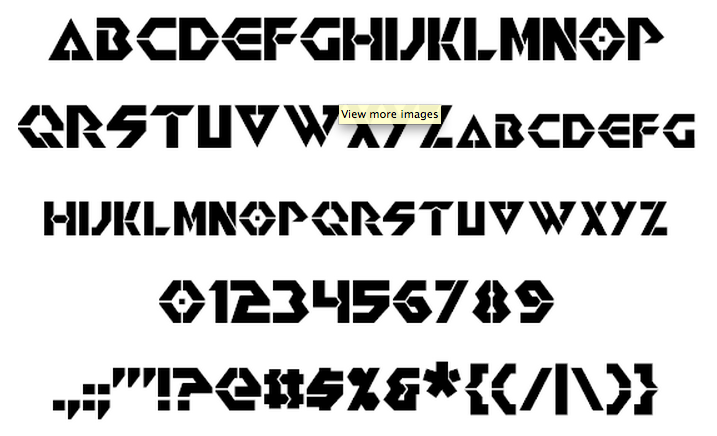 In 2011, he did the Yin Yang typeface Taiji, Noptical (+2x2), Genjimon, Festive, and the stencil typeface Vertical Basic. 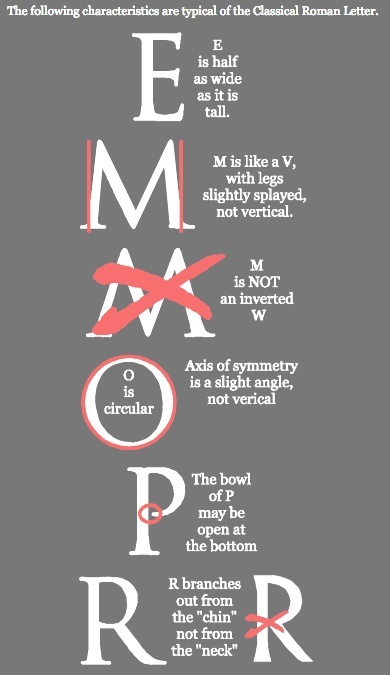 Aka the "Undergrond Grammarian". 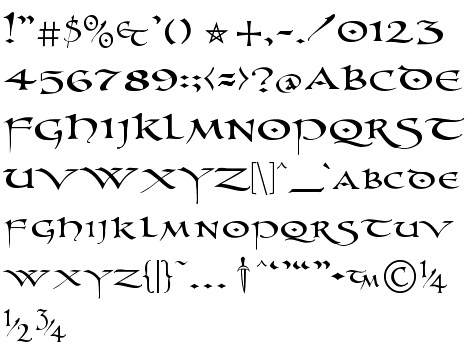 Designer of Amazigh-GraphicLight (a Berber font), ThebGL (Greekish runes, 1994), Morelife, Landliebe (2001, a connected roughly outlined script), Scarlett (2007, a gorgeous Mexican party theme font), Graphic Light, and Light Painter (1994). 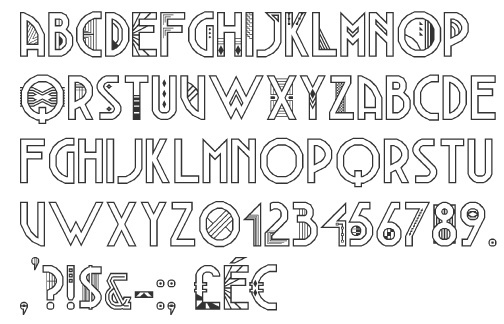 Hungarian type designer Roland Hüse (b. 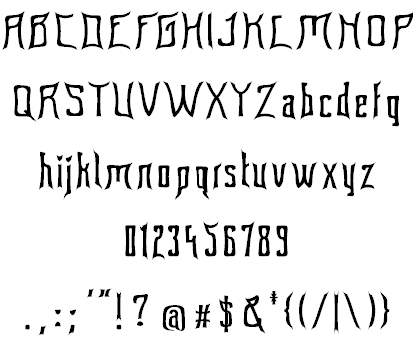 1980) sells his fonts through My Handwritings (Kazincbarcika, Hungary), which was renamed Runes&Fonts. 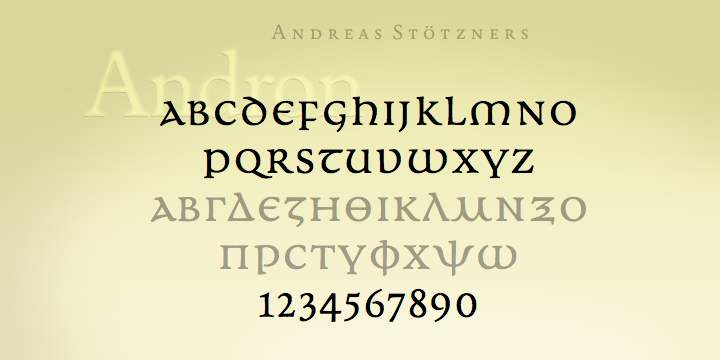 His first font is Zuider Postduif (2012, an informal type family). 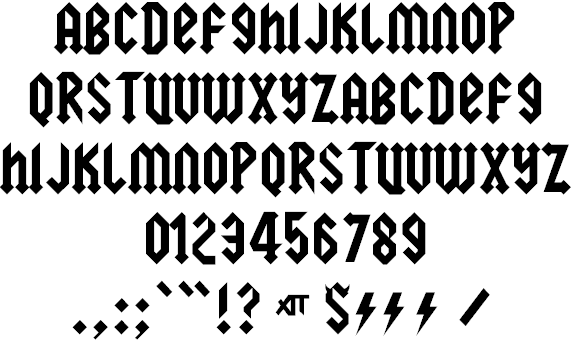 Florida Shark (2012) is a free Death Metal or tattoo version of one of his commercial fonts. 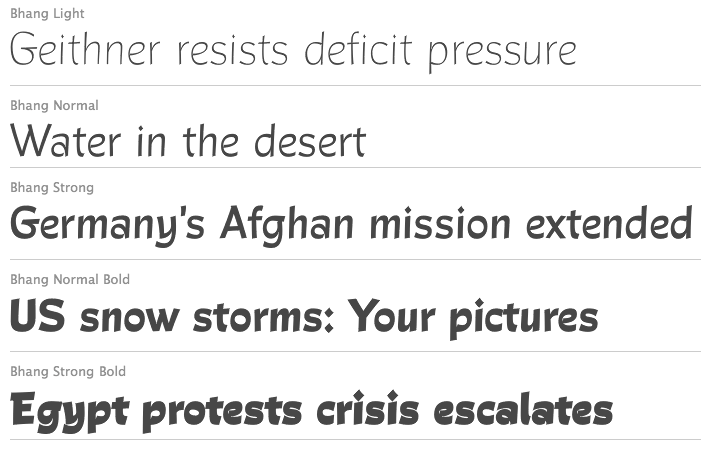 Tamiami (2012) is a headline typeface. 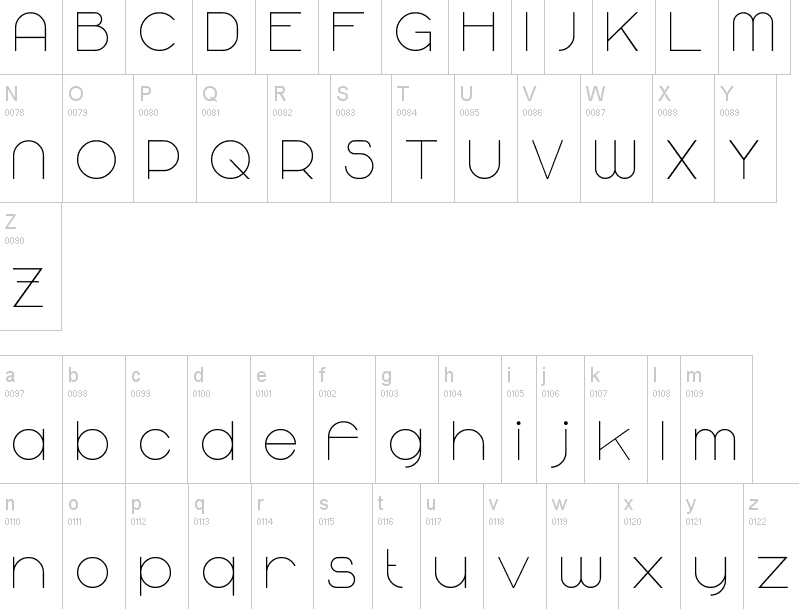 Granny's Handwriting (2012), Script Demolition (2012), Sharon Lipschutz's Handwriting (2012), Isa Por Es Homou (2012) and Kinga's Handwriting (2012) are hand-printed typefaces. Napping Cat (2012) and Cubic Sub (2012) are angularly designed, while Mgla (2012) is round and plump. Greek Stone (2012) is a squarish Greek simulation face. 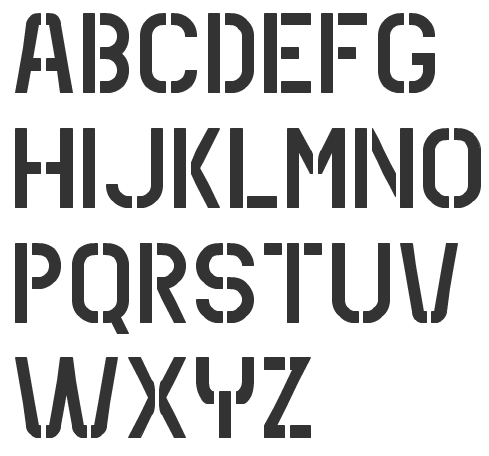 On The Road (2012) is a textured typeface. 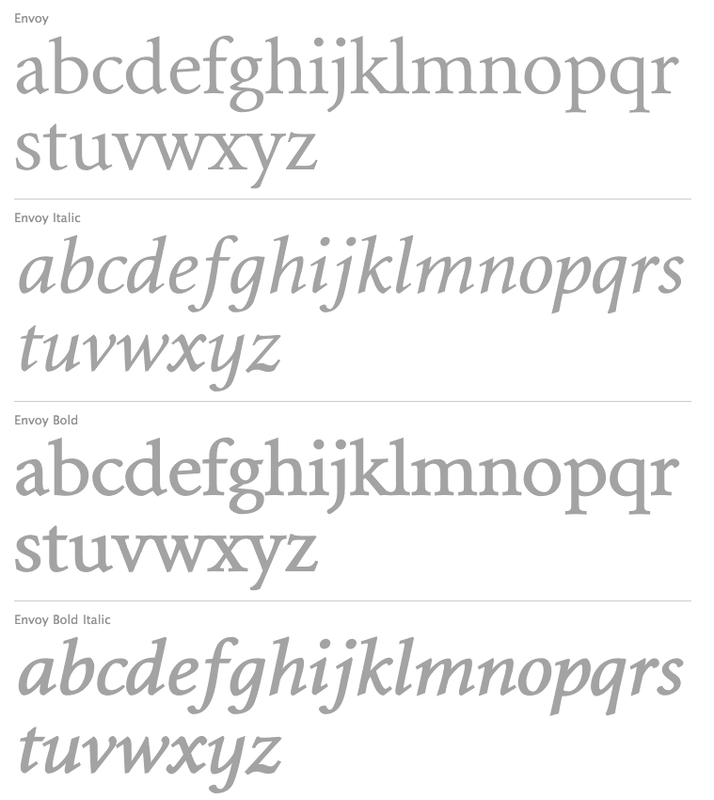 Whirly Wood (2012), Hargita (2012, inspired by ancient Hungarian runes), Dreamcatcher (2012) and Bee Ridge Vantage (2012: see also Bee Ridge) are grunge typefaces. 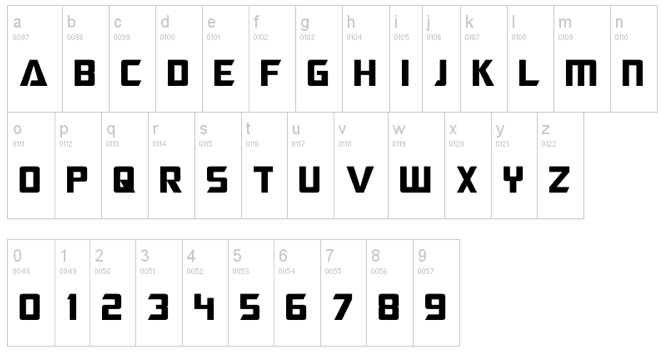 Individigital (2012, +Black, +Thin) is a techno set of typefaces. Typefaces from 2013: November Sky (art deco sans), Windy Wood, Cool Weekdays, Yellow Peas Light (clean thin monoline sans; free), Back To The Future 4, Yellow Peas Demo (hairline sans), Yellow Peas Bold, Pagan Winter (bilined), Beer Money (brush face), Poor Weekdays (+Serif), Hun Legion (inspired by ancient Hungarian runes), Freehand Roman, Esthajnal (inspired by ancient Hungarian runes), Buffalo Chicken (a connected script), Telihold. Typefaces from 2014: Sunny Winter (thin script), Sunny Merry Christmas (dingbats), Fox in the snow (connected hand), Dersu Uzala Brush (Asian brush), Good Karma (connected script), Stitch Warrior, Chickpeas, Jaspers Handwriting, Margarita in August, Wheatland, Slim Extreme (a gorgeous geometric hairline sans), Sparkler (a clean geometric sans), Factory Worker, Brushido (Japanese simulation font), Mojito in June, Mesa Grande, Altering The Future, Black Olives (thin calligraphic script), Hangyaboly (comic book font), Fecske (Peignotian sans), Windy Rain, Rainy Wind (calligraphic script), Comic Roman, Wizard of the Moon, Urban Stone (grunge version of Urban Tour), Urban Tour (avant garde sans), Wacky Sushi (hiragana emulation)Constrocktion (multilined typeface). Typefaces from 2015: She Always Walk Alone (hand-crafted), Transatlantic Cruise (an outline script), Csemege (upright connected script), Milano Traffic (sketched typeface), Undergrunge Tornado (a great brush font, +Cyrillic, +Hiragana, +Katakana), Dirt Road, Kikelet, Kikelet Brush, Have A Great Day (rough brush script), Sorsod Borsod, City Birds (script), Loonaria, Texas Grunge (brush script), Solaria (minimalist techno), Biloxi Script, Chicken Fried Steak, Texas Grunge (brush face), Sharky Spot, Autumn Chant (connected script). 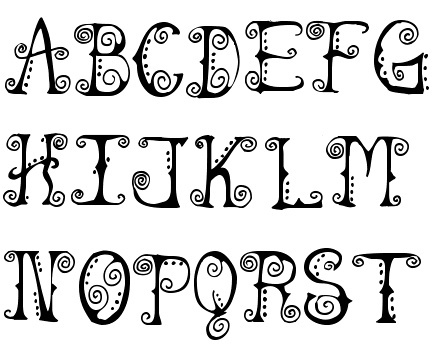 Typefaces from 2016: Tribal Case (decorative caps), Shopping Script, Biloxi Calligraphy, Tribal Case (tattoo font), Ting Tang, Alaska Script, Take It Easy (fat finger font), Mi Amor (wide monoline handwriting), Spring Script, Fox in the Snow (connected school script), Kazincbarcika Script (a gorgeous calligraphic script). Typefaces from 2017: Interconnected, Bar Hoppers, Ciao Baby (retro signage script), De Rotterdam, Abigail Script. Typefaces from 2018: Christmas Wish Calligraphy, Christmas Wish Monoline, Chicago Moonshine (art deco), Poker in October (stencil), Personalitype (connected monoline script), Yellow Peas (sans), The Laughing Wolf (script), Italian Breakfast, Saturday Champagne, Teach (by Moataz Ahmed), Long Night (signature script), Relapse (rough brush script), Just Be (brush script), Air in Space (stencil), Beach Script, Interconnected, Beaumaris (slab serif). 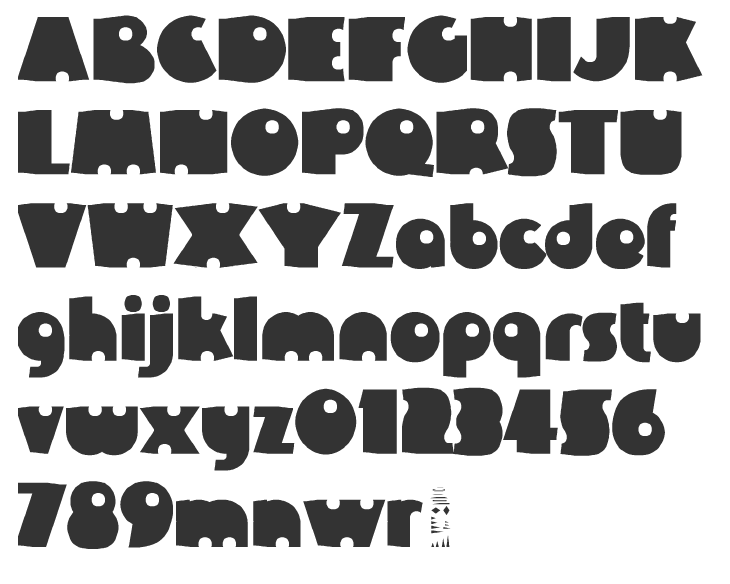 Typefaces from 2019: The Mumbai Sticker (script). 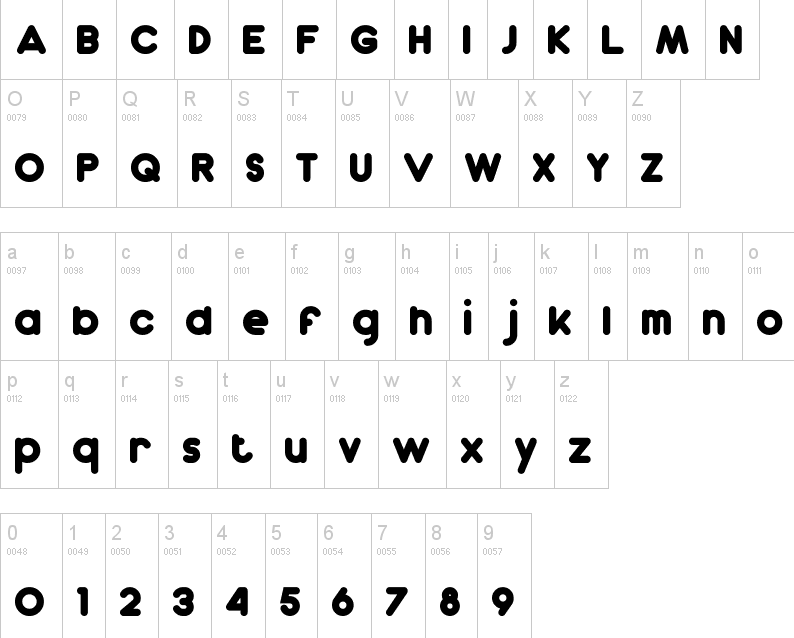 Aaahoj: a ransom note font. 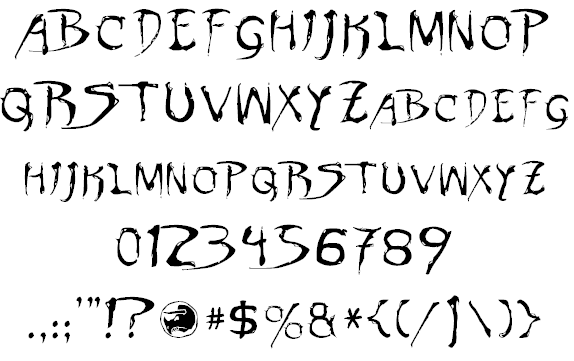 Abald (2005): Abald adds to the number of "bad-taste" alphabets as seen on faded commercial inscriptions painted on neglected old houses. Academica: Josef Týfa first published Academia in 1967-68. 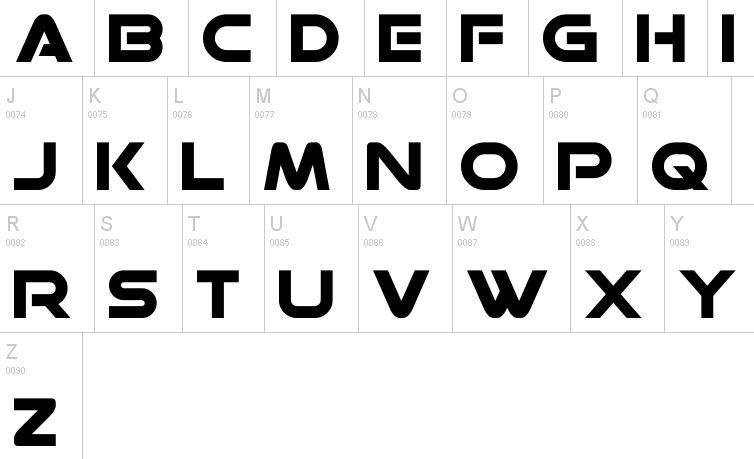 It was the winning design in a competition for scientific typefaces, announced by Grafotechna. 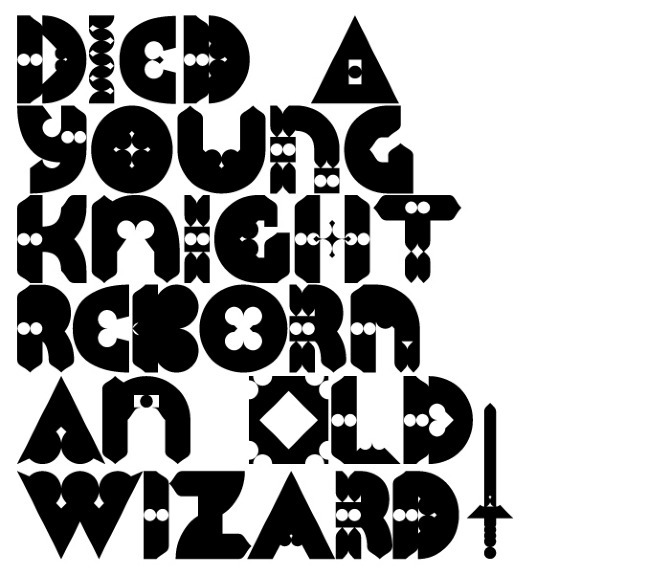 It was cut and cast in metal in 1968 in 8 and 10 point sizes in plain, italic and semi-bold designs. 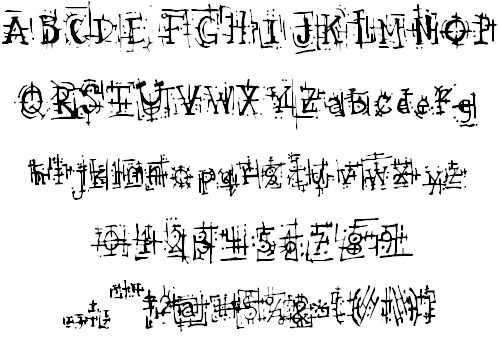 In 2003 Josef Týfa and Frantisek Storm began to work on its digital version. The new name Academica distinguishes the digital execution (and modifications) from the original Academia. 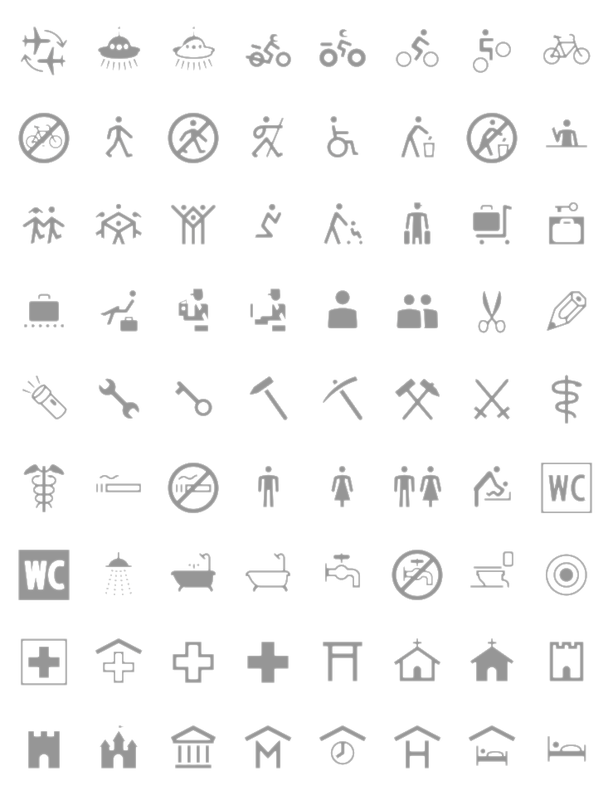 Aichel: originally designed for use in architecture (in this particular case for a UNESCO memorial plaque for a church built by Jan Santini-Aichel on Zelenà Hora). It has a stone-chiseled look. Alebrije (2015). 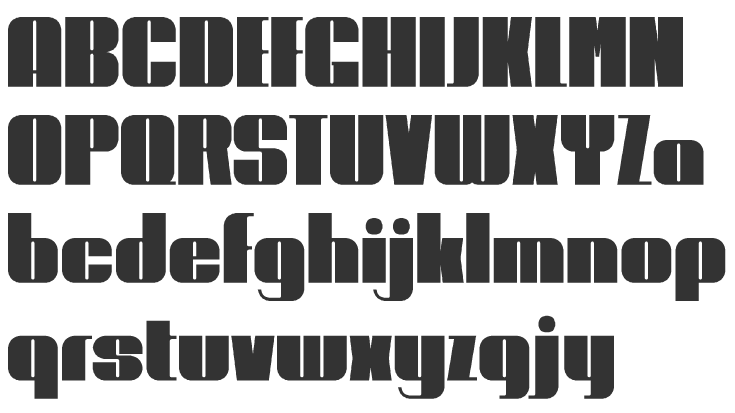 A 42-cut exaggerated cocaine-driven typeface family with instantly recognizable v and w that have slabs on their baselines. 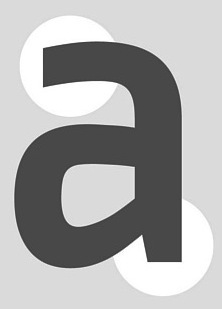 Amor Sans and Amor Serif (2005). Amphibia (2016). 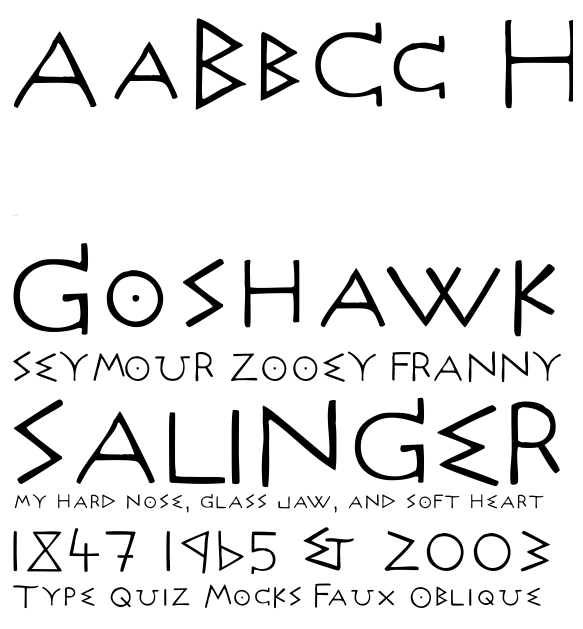 A lapidary typeface family. 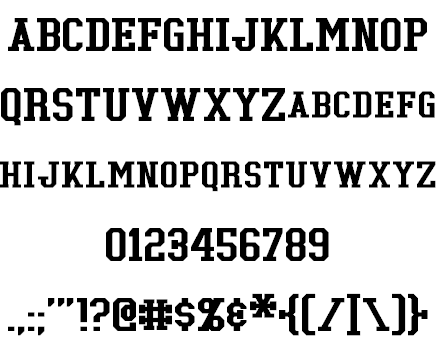 Andulka (2004): 24 weights for use in books, mags and newspapers. 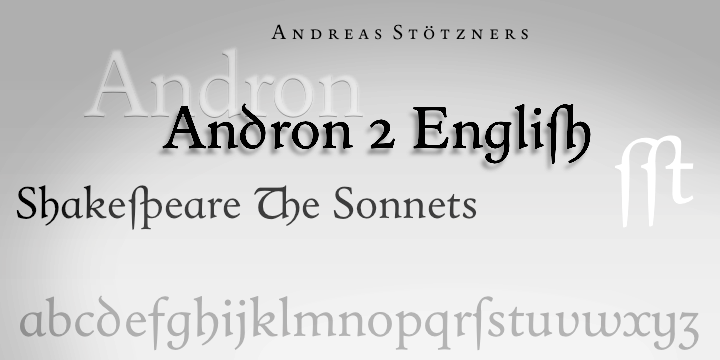 Extended in 2011 to Andulka Sans. 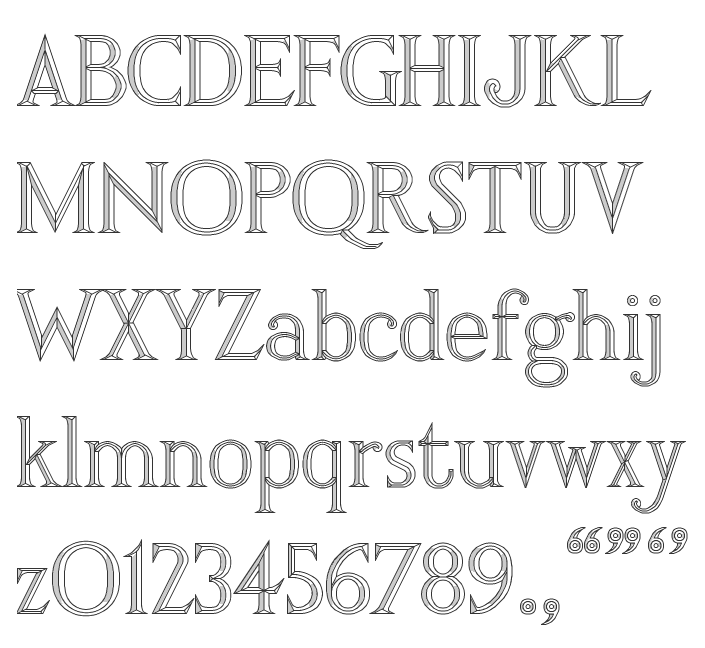 Antique Ancienne, Moderne&Regent (2000): Baroque typefaces. 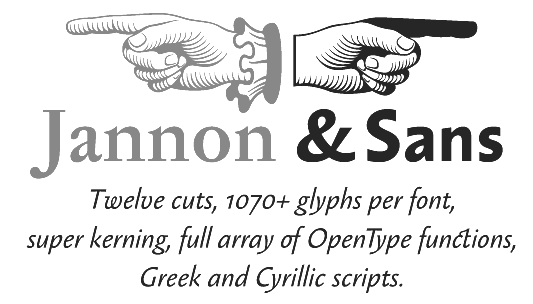 Anselm Sans and Serif (2007): 20 styles about which Storm writes The ancestry of Anselm goes back to Jannon, a slightly modified Old Style Roman. I drew Serapion back in 1997, so its spirit is youthful, a bit frisky, and it is charmed by romantic, playful details. Anselm succeeds it after ten years of evolution, it is a sober, reliable laborer, immune to all eccentricities. It won an award for superfamily at TDC2 2008. It covers Greek as well. 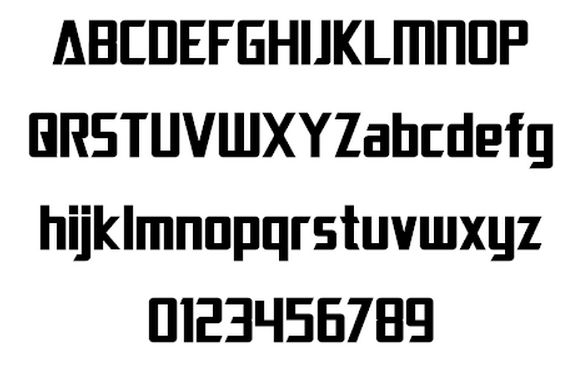 Areplos (2005): Based on Jan Solpera's 1982 typeface with serifs on top and serifless at the bottom. 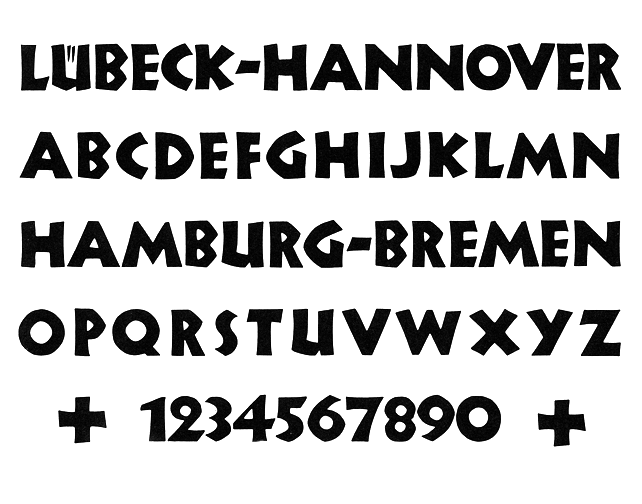 Bahnhof: poster typeface from the 1930s. 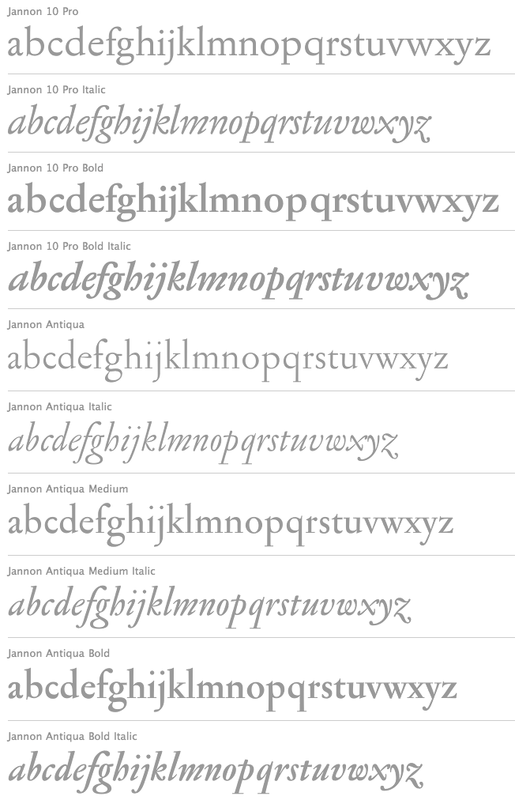 Baskerville Original Pro (2010) comprising Baskerville 10 Pro, Baskerville 10 Cyr, JBaskerville, and JBaskerville Text. This is an important and thoroughly studied execution starting from photographs of prints from Baskerville's printing office, ca. 1760. Beletrio and Beletria (2018). 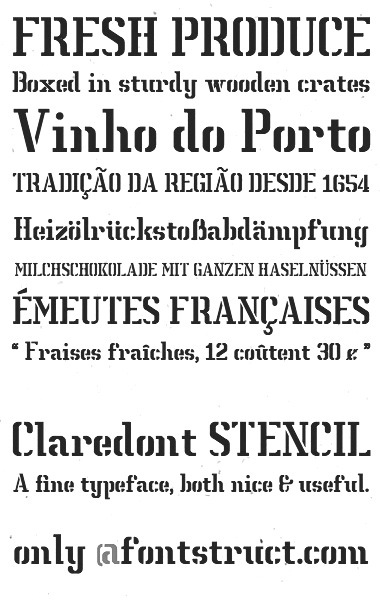 Beletria (26 styles) is intended as a modern book type. 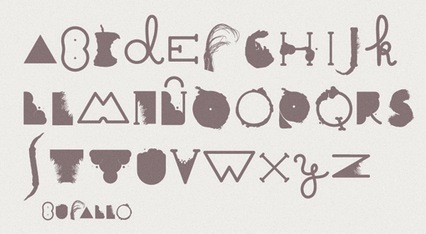 Beletrio is a peaceful accompanying sans. 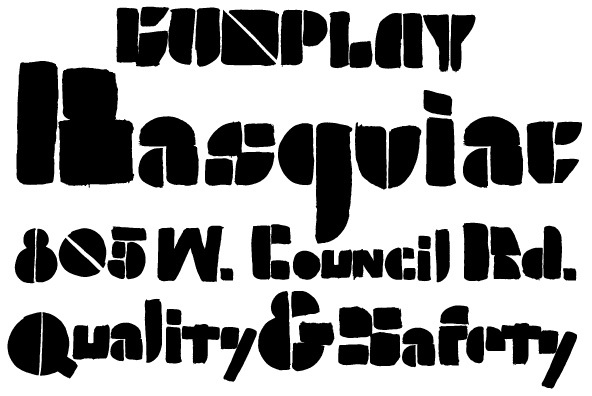 Bhang (2011) is a flat brush signage family of exceptional balance. 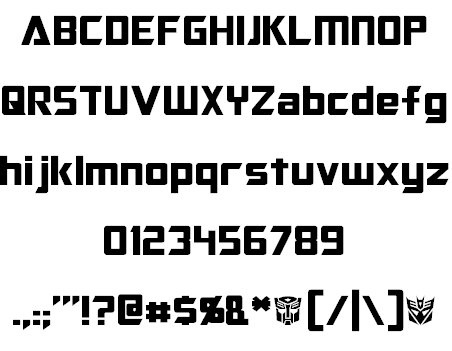 Biblon (2000; note: ITC Biblon is a watered down version of Biblon, so please go for the original, not the ITC version). 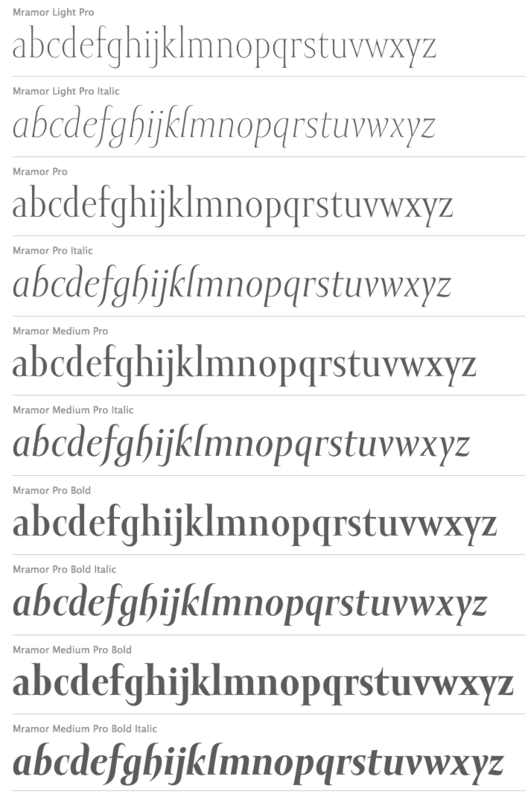 Biblon Pro (2006) is even better; 6 weights. 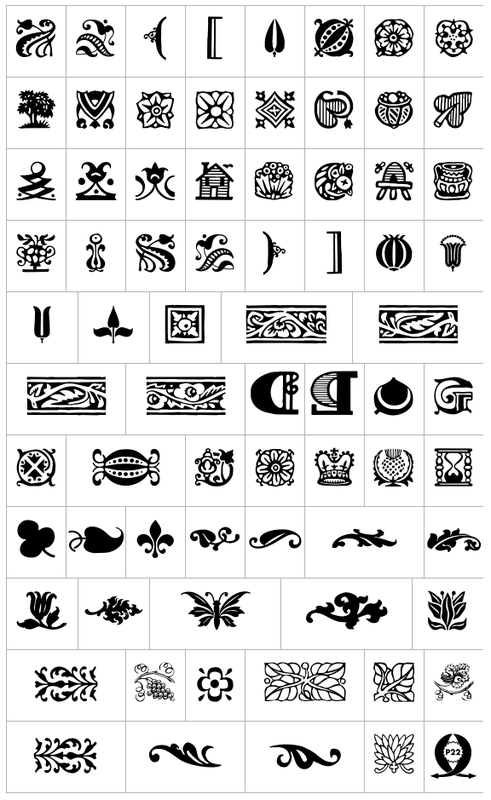 Briefmarken (2008): letters that look dented like postage stamps. 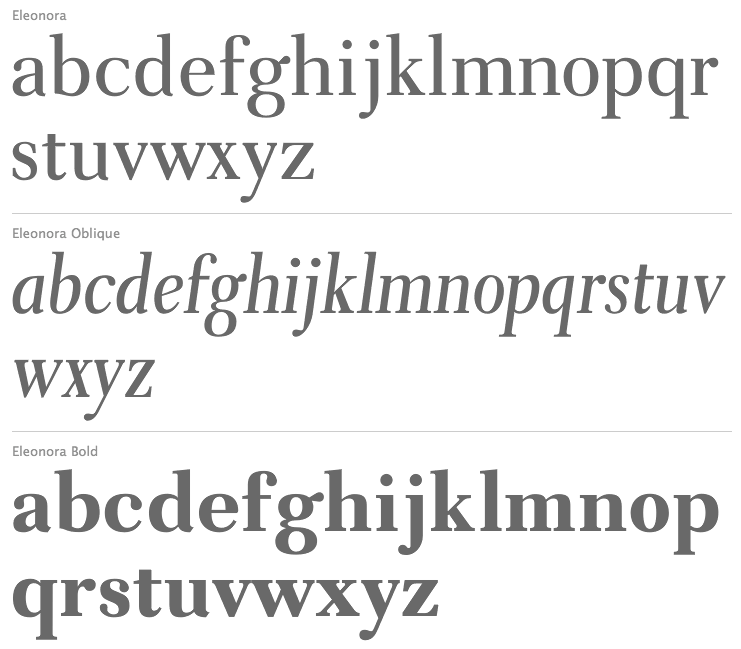 Clara Sans and Clara Serif (2014). 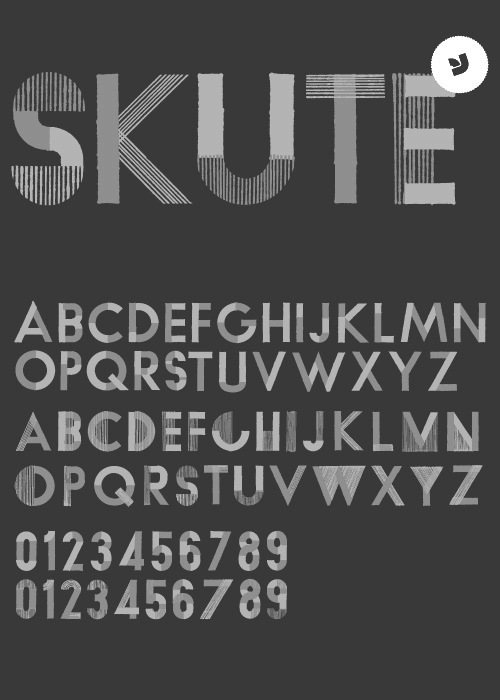 Based on sketches by Rotislav Vanek, and published at Signature Type Foundry. 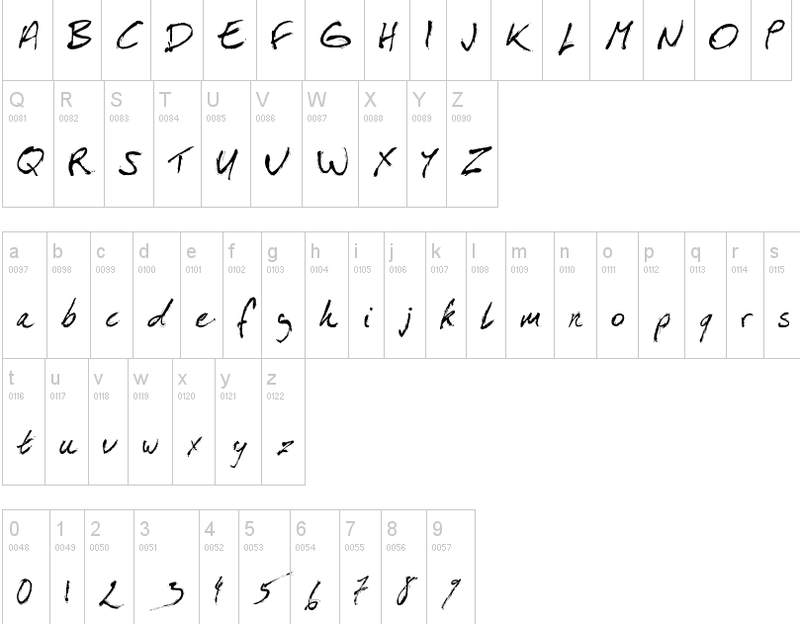 Comenia Script (Radana Lencov&acaute;), an upright script with a handwritten look for teaching writing. 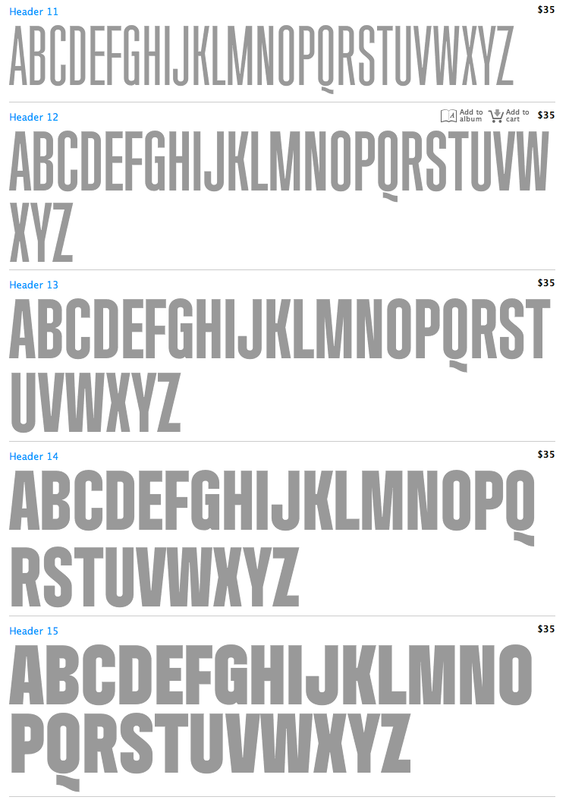 Comenia Text (2006): a serif family for school books. 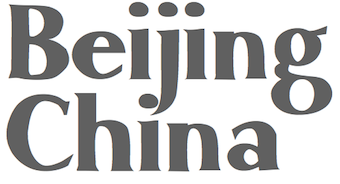 Also called Comenia Pro Serif. Coroner (2018). 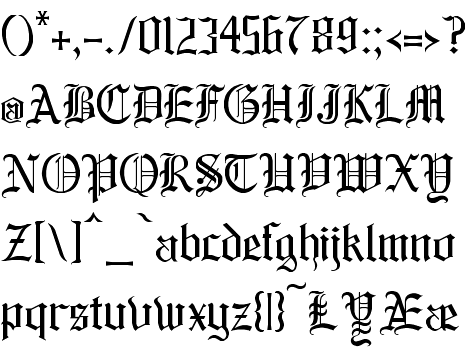 A blackletter first sketched in 1988. 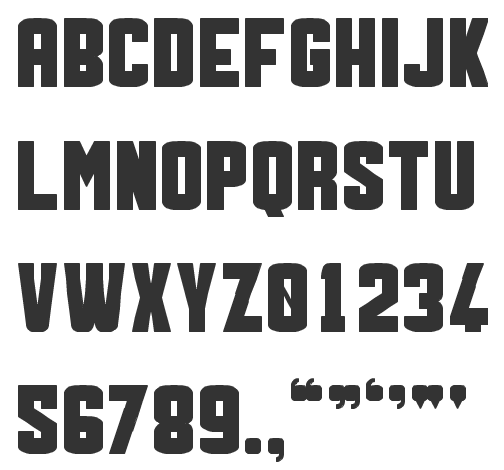 Defender (2008): a heavy slab family. Dracula (2017). 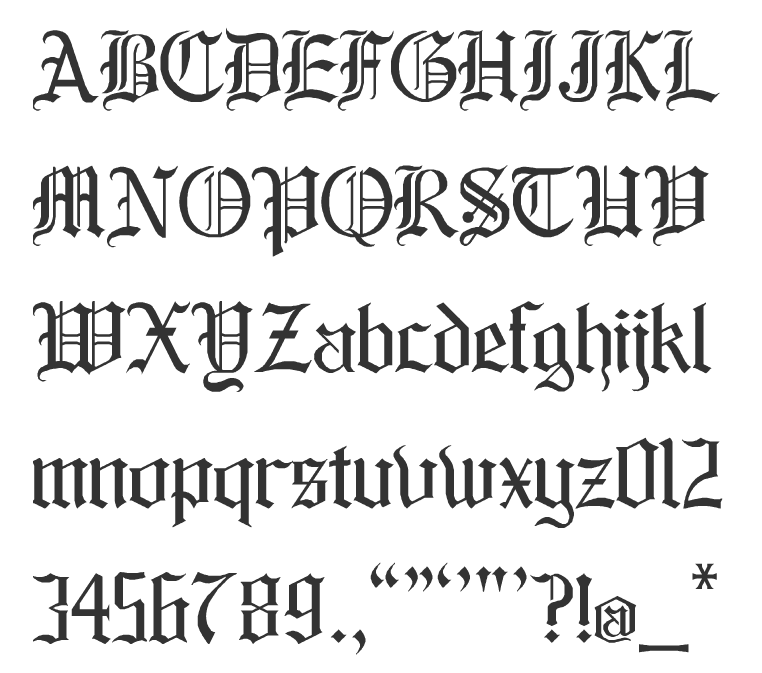 A great blackletter family. 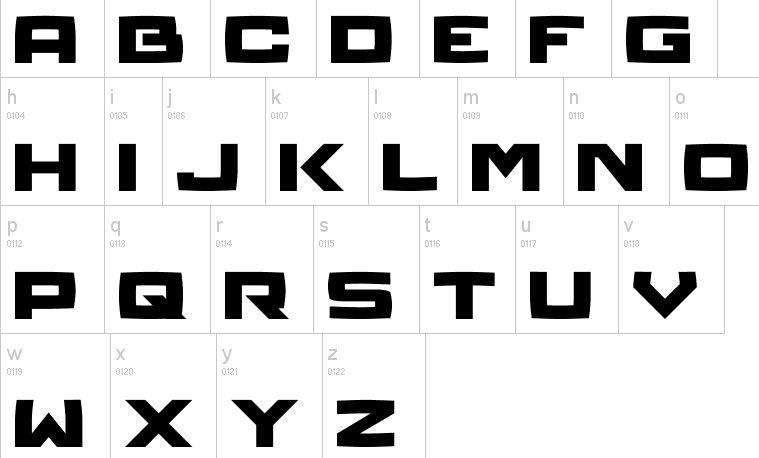 Dynamo Grotesk (1995): Storm's 60-weight sans family going back to the early sans traditions. 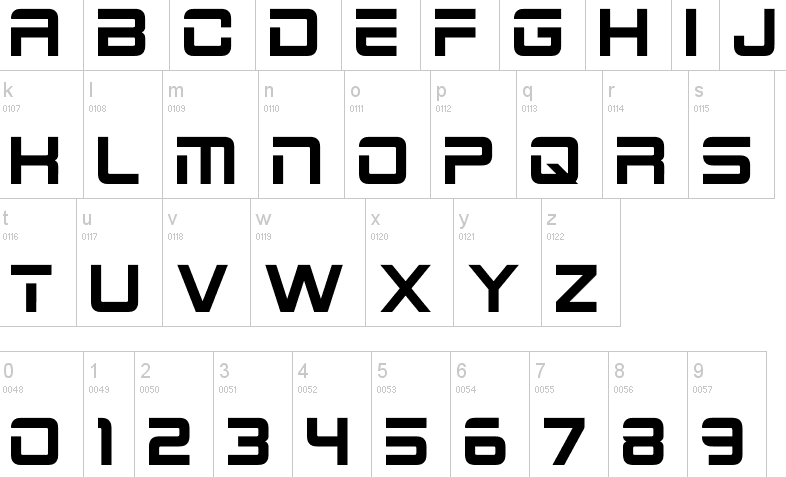 In 2009, this was updated to Dyna Grotesk Pro. 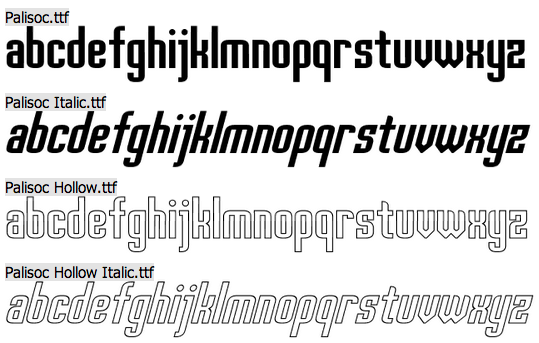 Etelka (2005): a corporate identity sans family, which became commercial in 2006. 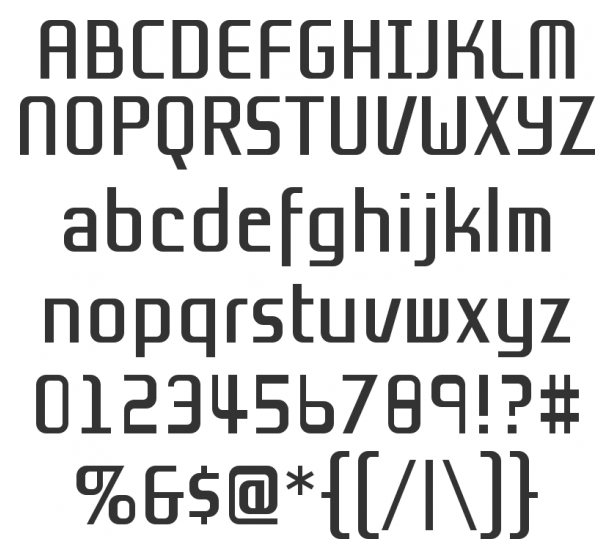 Four Etelka Monospace styles were added in 2008. 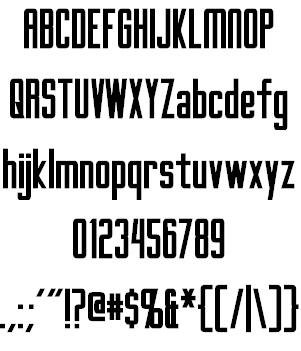 Excelsior Script (1995-1996), perhaps renamed Excelsor Script around 2000. Friedhof (2011). 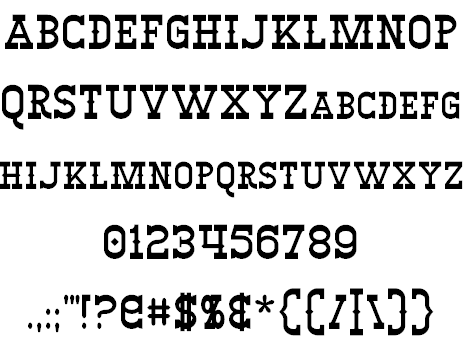 A family based on tombstone lettering from ca. 1900. 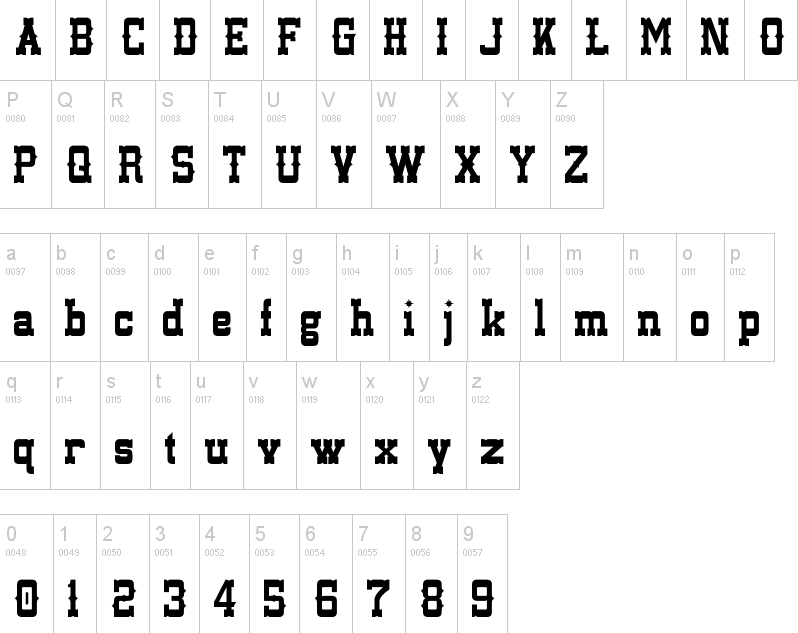 It contains handtooled and shaded (Geist + Deko) variations. 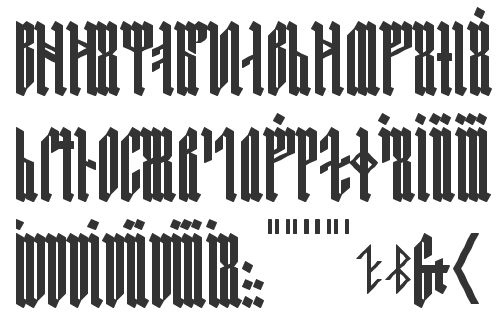 Carolingian-Roman-Gaelic-Uncial script, or an exploration into how the Latin alphabet could look were the evolution of the Carolingian Minuscule to stop in the 8th century AD in Sankt Gallen. 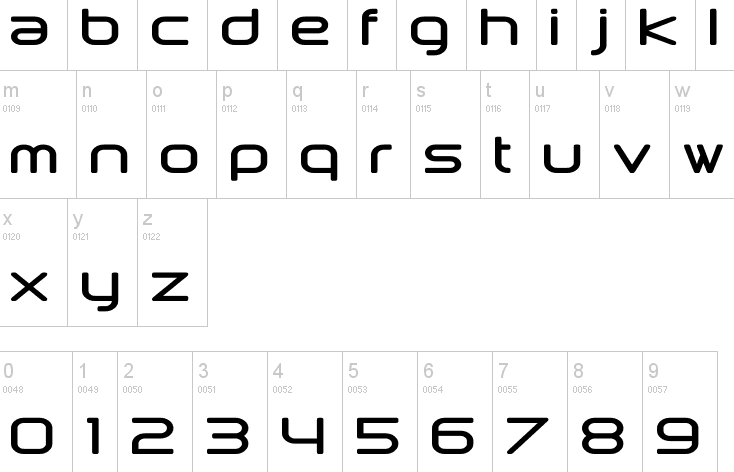 Fenix 21 through 23 (2010): An elliptical sans family that includes a hairline (21). Header (2009): a magazine headline family. 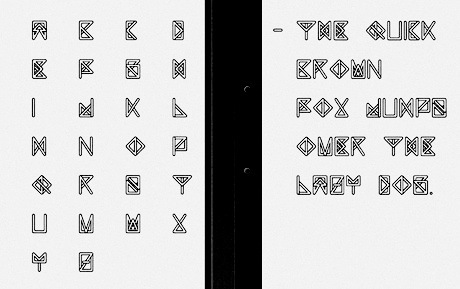 Hexenrunen (2006, + Reverb): a runic simulation face. Inicia (2018). A sans originally drawn in the 1980s. Jannon (this is a formidable Garalde family). 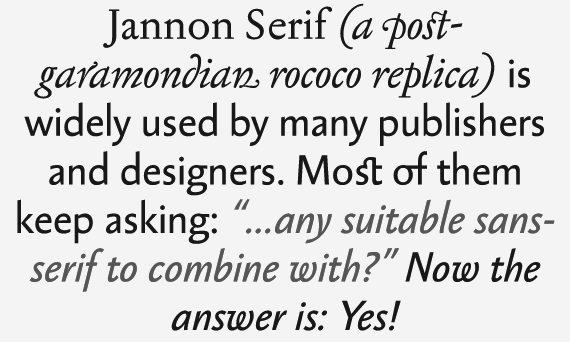 Jannon Pro appeared on MyFonts in 2010. Jasan (2017). 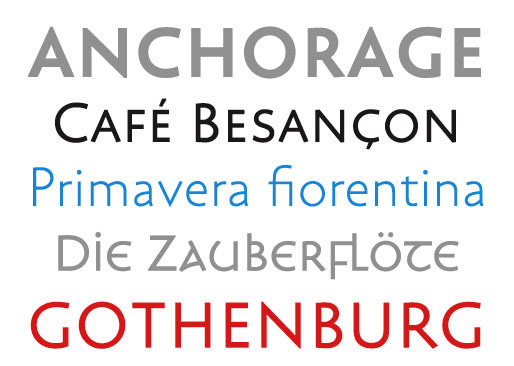 A 36-strong sans family with lots of wide styles. Josef Sans (2013, with Jan Solpera). 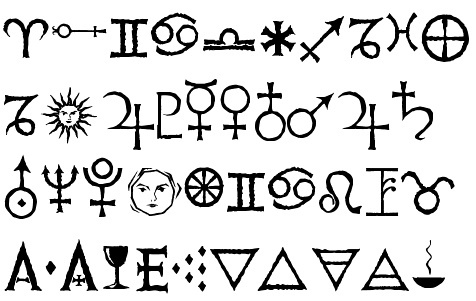 A humanist sans family related to Josef Tyfa's Tyfa Roman (Tyfa Antikva). 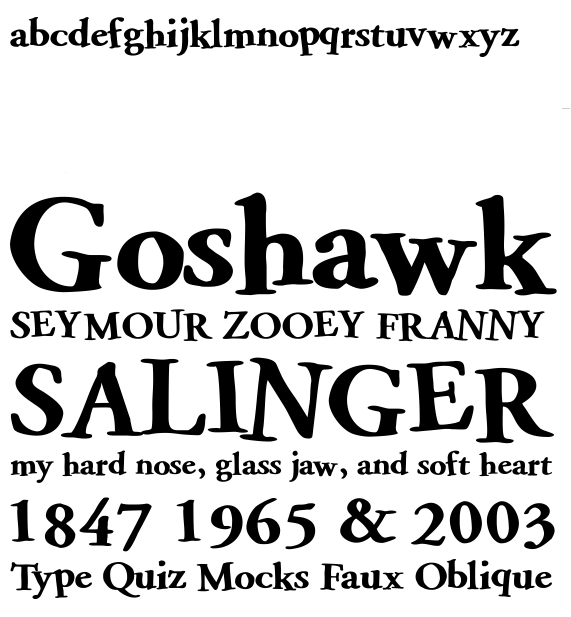 Lexicon Gothic: newspaper and magazine type family, created in 2000. 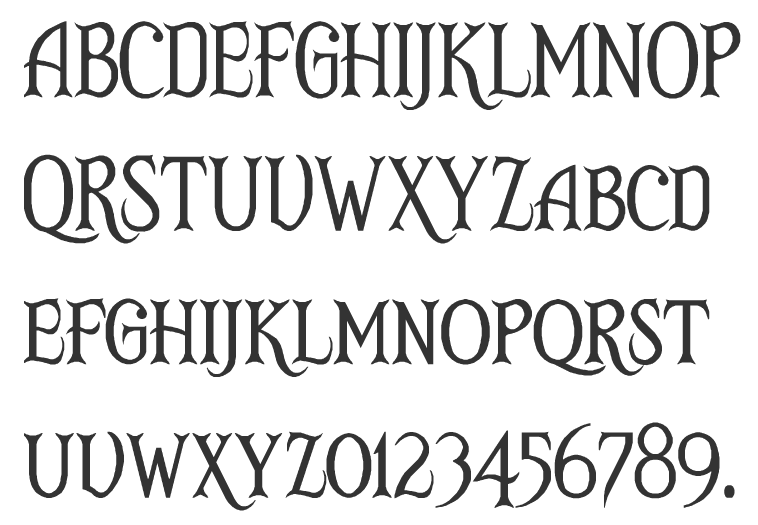 Renamed Lexon Gothic. 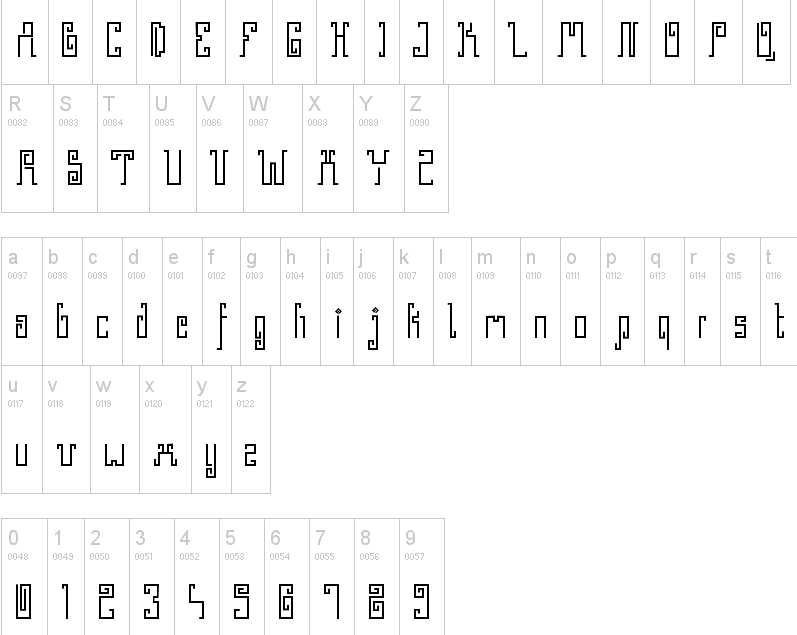 Lokal Script (2009): a large hand-printed letter family. 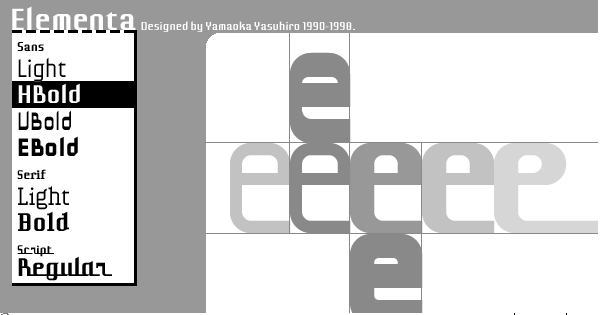 ITC Malstock (1996-1997), a condensed film poster face. 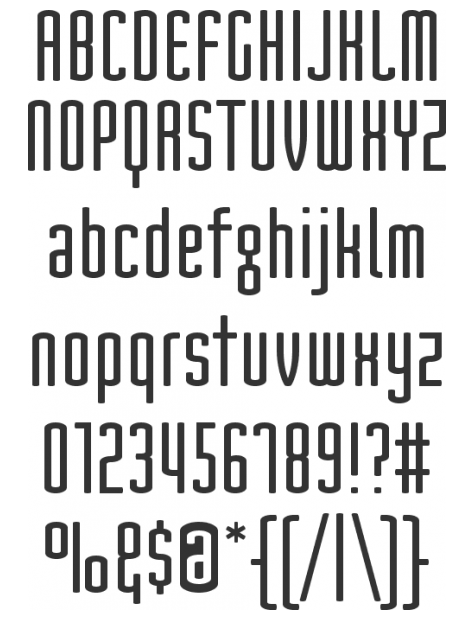 Metron (2004, a digital version by F. Storm and Marek Pistora after a huge sans design from 1973 by Jiri Rathousky, which was commissioned by the Transport Company of the Capital City of Prague in 1970 to be used in the information system of the Prague Metro. In 1986, the metro started using Helvetica): this typeface is eminently readable! 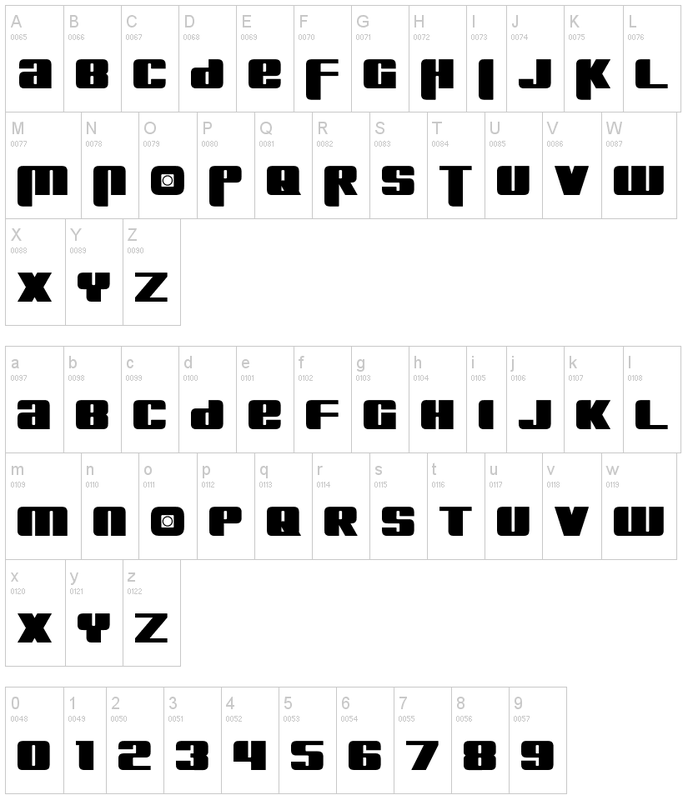 Moyenage (2008): a 25-style blackletter family for Latin and Cyrillic, almost an experiment in blackletter design and flexibility. Winning entry at Paratype K2009. Mramor (1988-2013). 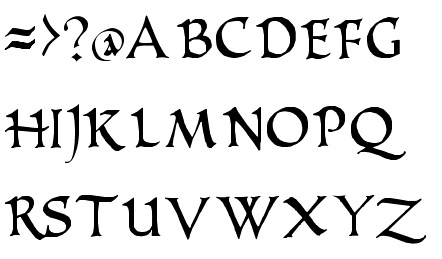 A roman caps typeface with lower case added. 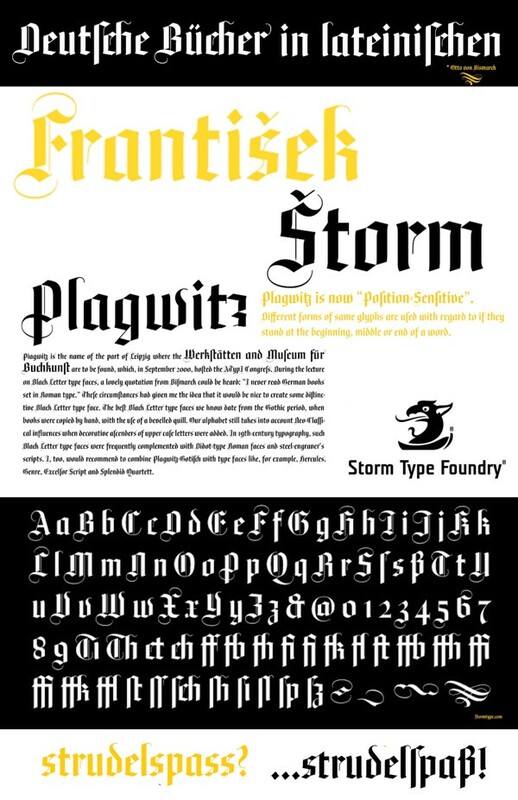 Storm: The text designs are discontinued since they were replaced by the related Amor Serif family (along with its -sans version). 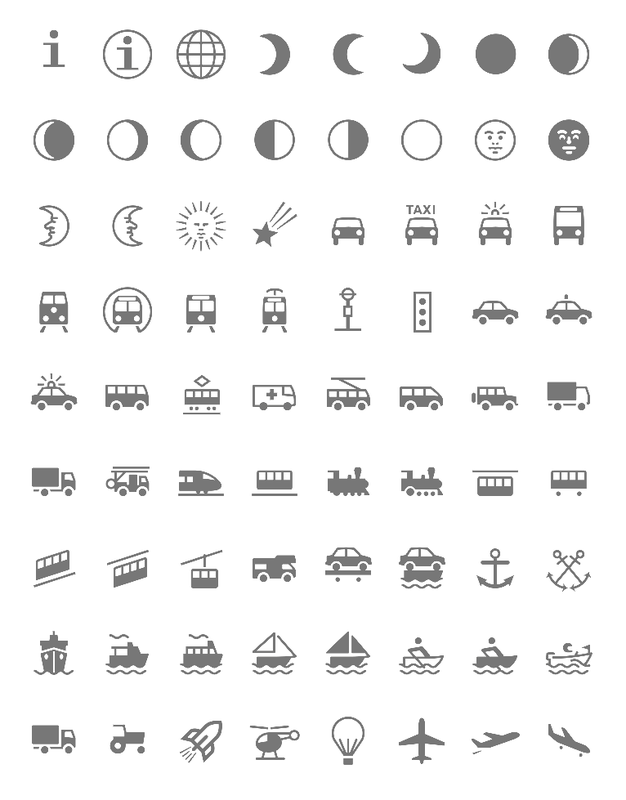 Even so, ten display styles are left. 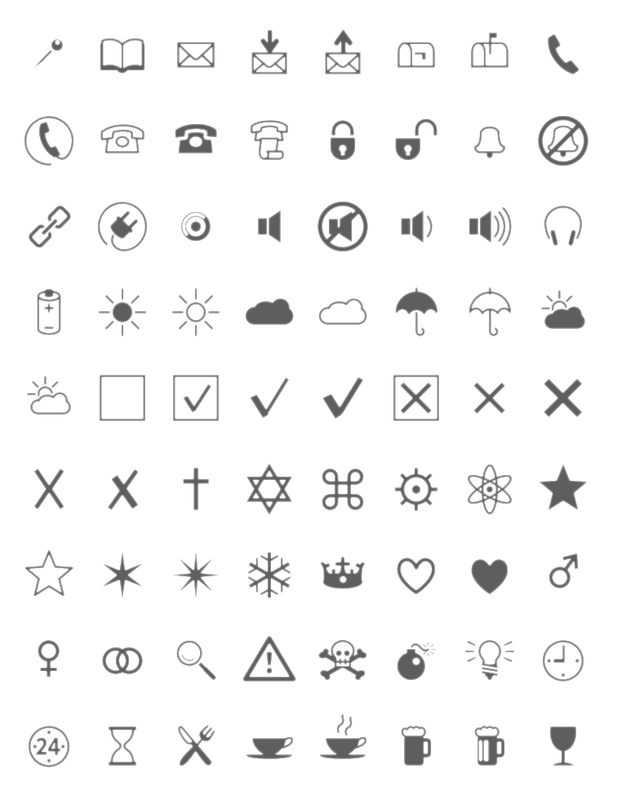 Ozdoby 1+2 (great dingbats): The set includes heraldic figures, leaves, decorative endings, various skull forms, weather signs, borders and many more. Pepone and Pepone Stencil. 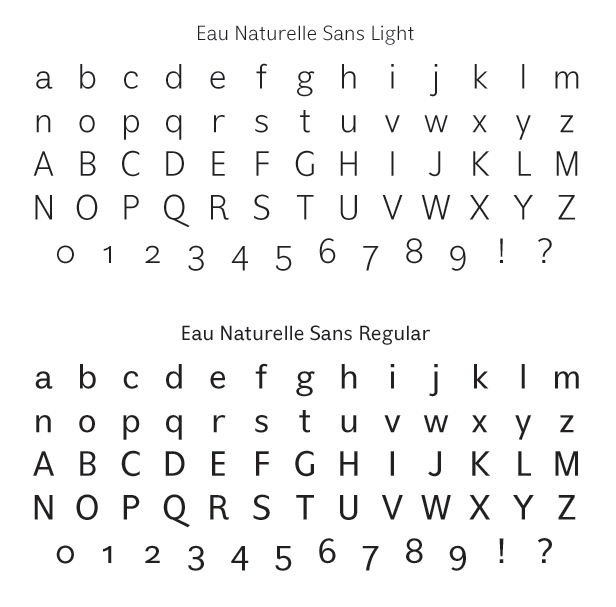 Designed for setting belles-lettres, this serifed family defies classification. 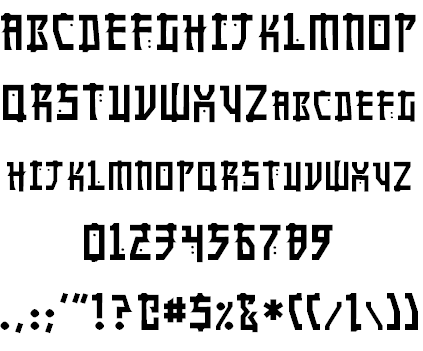 Pivo (2006), a connected diner script inspired by Bohemian beer labels. 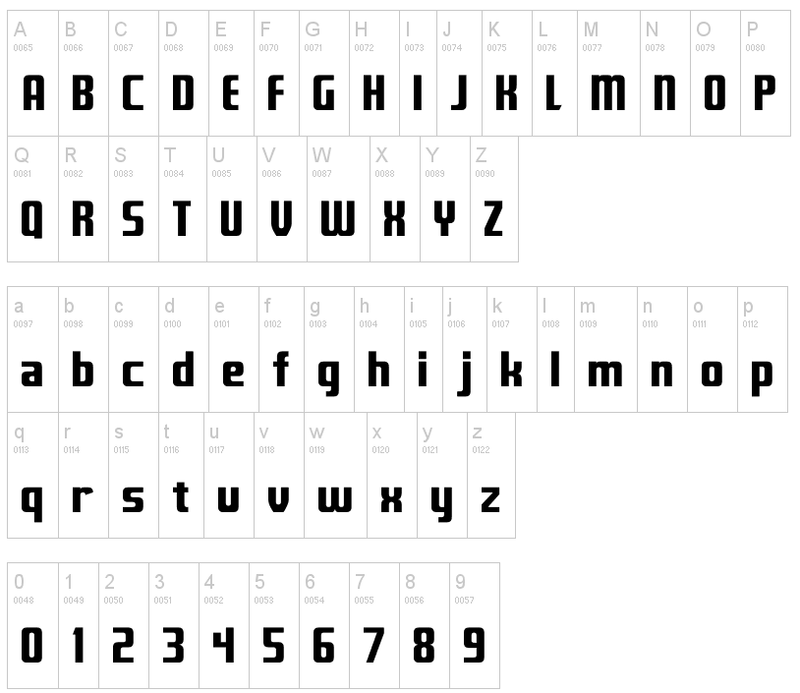 Plagwitz (2000, blackletter). Plagwitz poster by Lissa Simon (2012). Politic (2004): a clunky fat octagonal family made for billboards, flyers, posters, teabags, and matches for the green Party in the 2004 Czech elections. Caps only. 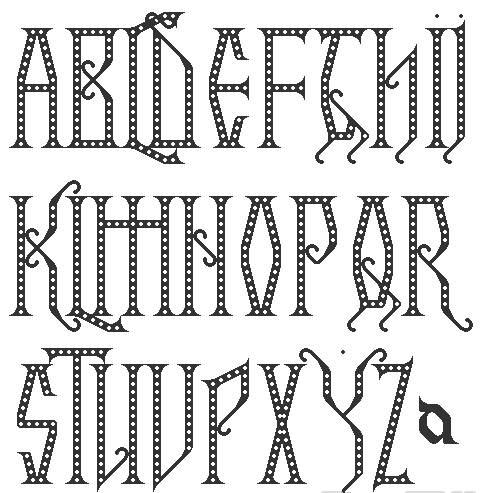 Preissig Antikva + Ornaments: a 1998 digitization and interpretation of Preisig's polygonal type from 1925. The Pro version is from 2012. 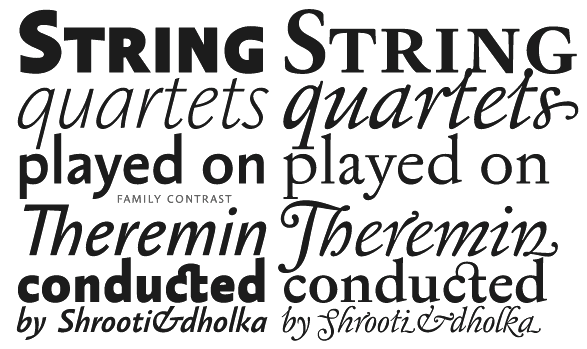 Regent Pro (2015): a rustic Baroque typeface that oozes energy out of its semi-transitional semi-didone orifices. 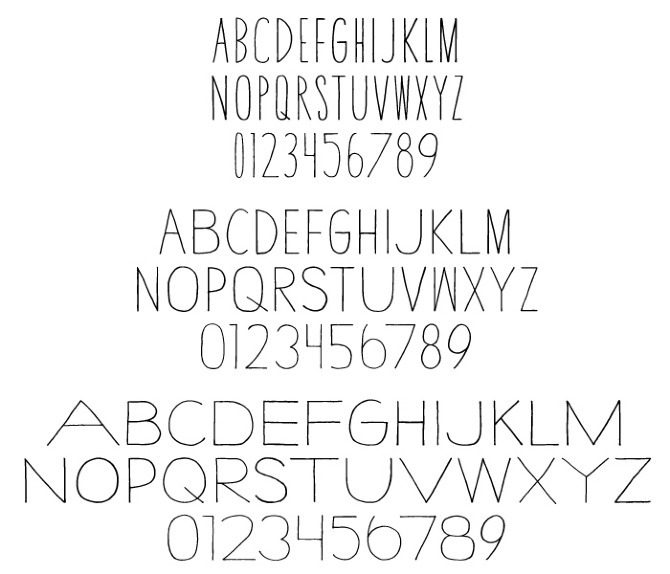 Quercus Whiteline, Quercus 10, Quercus Serif, and Quercus Sans (2015). Four large families, created for informational and magazine design, corporate identity and branding. The sans has a Gill flavor. Regula Text and Regula Old Face. 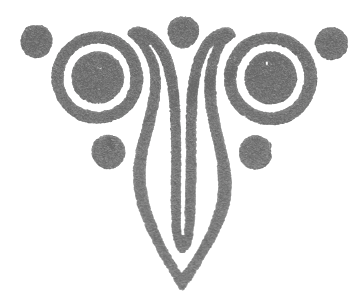 Regula is named after the secular monastic order Regula Pragensis. 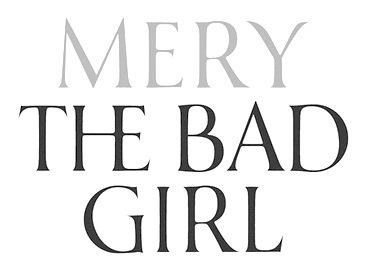 Initially, the digitized font (regular old Face, which is now free) had jagged edges and a rather narrow range of applications until the summer of 2009, when Storm added text cuts. 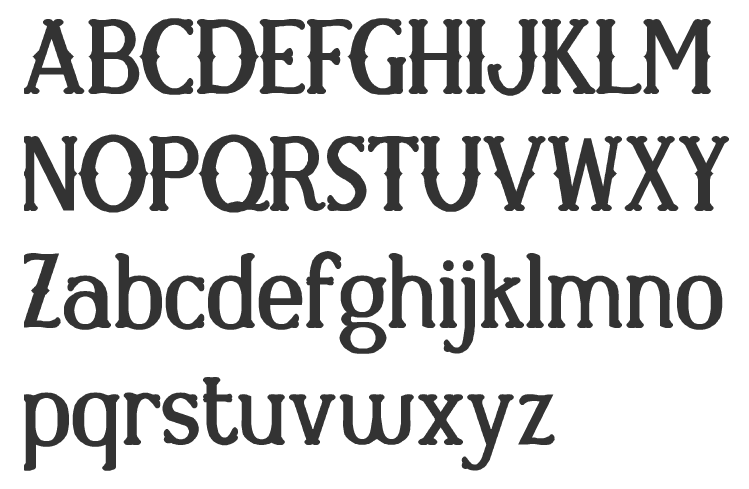 Regula was a baroque alphabet faithfully taken over from a historical model including its inaccuracies and uneven letter edges. 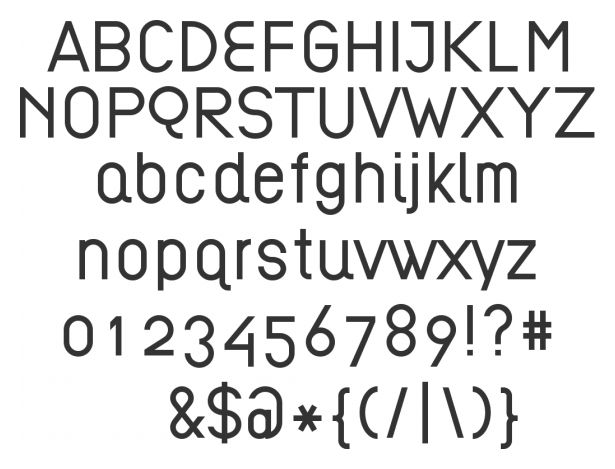 Sebastian (2003, a sans with a funky italic), about which he writes: Sans-serif typefaces compensate for their basic handicap---an absence of serifs---with a softening modulation typical of roman typefaces. 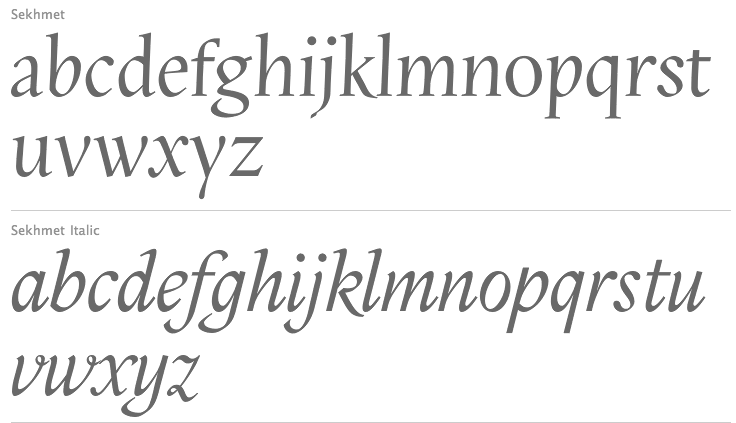 Grotesques often inherit a hypertrophy of the x-height, which is very efficient, but not very beautiful. They are like dogs with fat bodies and short legs. More# Why do we love old Garamonds? Beside beautifully modeled details, they possess aspect-ratios of parts within characters that timelessly and beauteously parallel the anatomy of the human body. Proportions of thighs, arms or legs have their universal rules, but cannot be measured by pixels and millimeters. These sometimes produce almost unnoticeable inner tensions, perceptible only very slowly, after a period of living with the type. 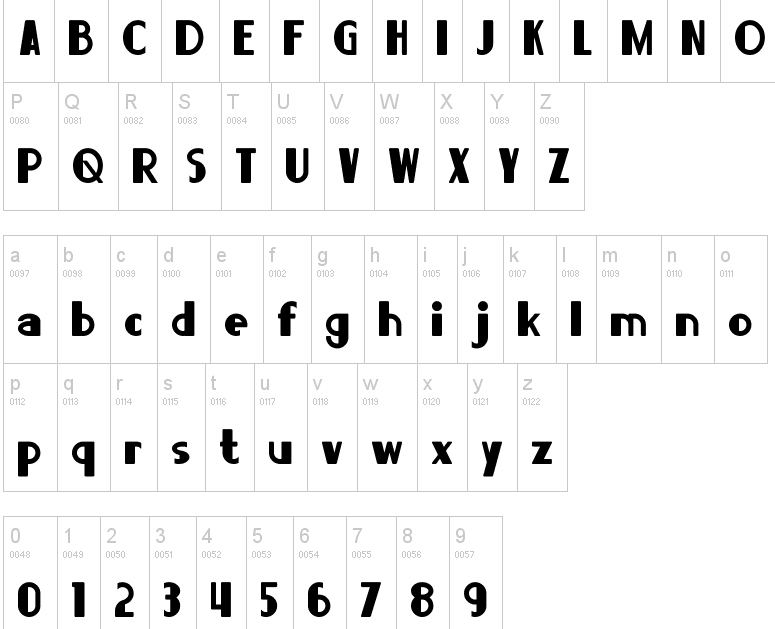 Serifed typefaces are open to many possibilities in this regard; when a character is mounted on its edges with serifs, what is happening in between is more freely up to the designer. In the case of grotesques, everything is visible; the shape of the letter must exist in absolute nakedness and total simplicity, and must somehow also be spirited and original. 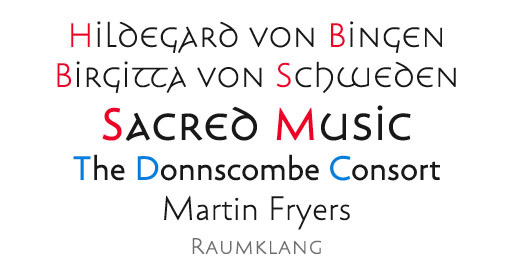 Splendid Quartett: an Antiqua, a sans, a bold and a script. 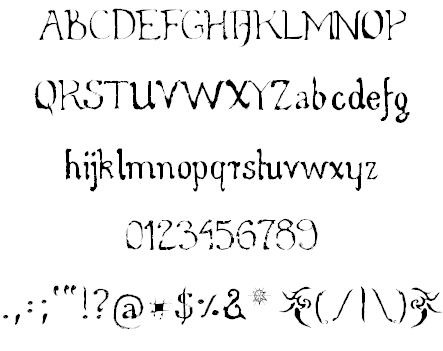 Stor writes: The script was freely transcribed from the pattern-book of the New York Type Foundry from 1882, paying regard to numerous other sources of that period. St Croce (2014). 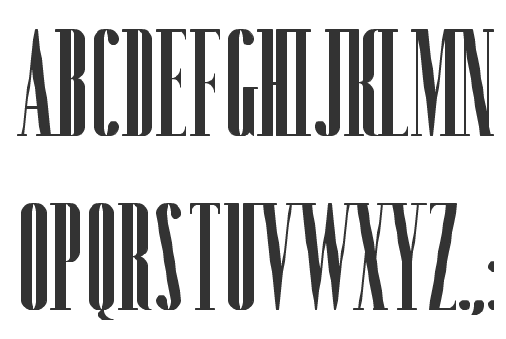 Based on worn-out lettering on tombstones in the St. Croce Basilica in Florence, this is a flared lightly stenciled typeface family. 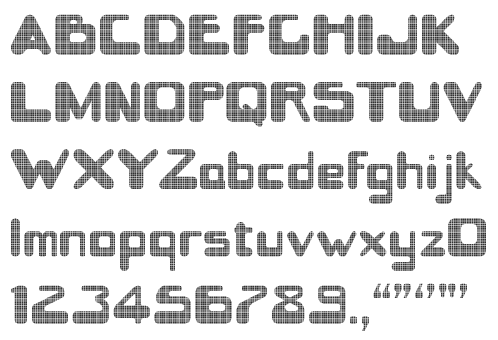 Technomat (2006): this typeface takes inspiration from matrix or thermal dot printers. 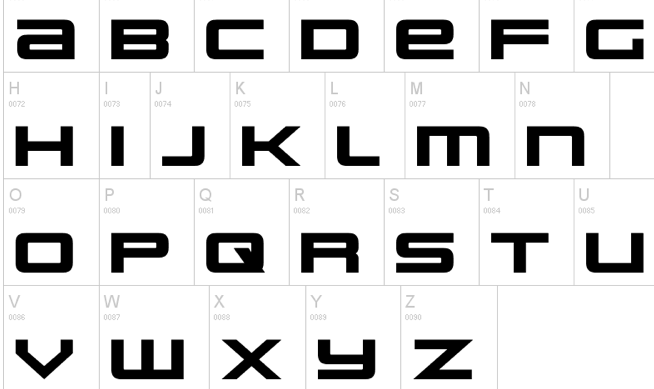 Trivia Sans (2012), Trivia Serif (2012, a didone), Trivia Serif 10 (2012), Trivia Grotesk (2012, 48 cuts), Trivia Gothic (2013), Trivia Slab (2012), and Trivia Humanist (2013, a strong wedge serif family: I wanted a clear and majestic typeface for book jackets, LP cover designs, posters, exhibition catalogues and shorter texts). 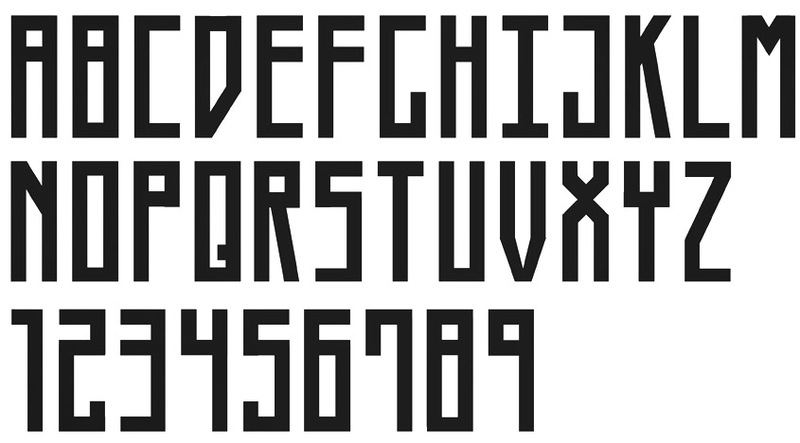 Tyfa ITC + Tyfa Text: Designed by Josef Týfa in 1959, digitized by F. Storm in 1996. 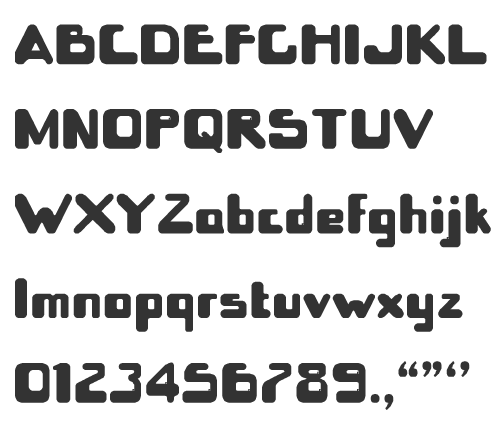 Vida Pro (2005), a big sans family designed for TV screens. 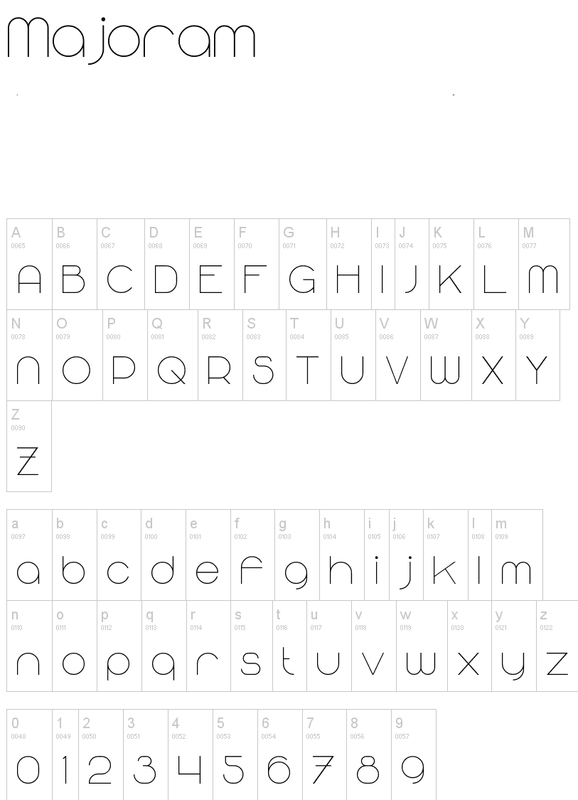 Vida Stencil Demo is free. 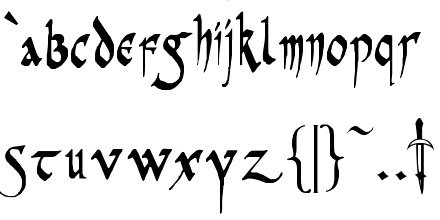 Walbaum Text (2002). Walbaum 10 Pro (2010) and Walbaum 120 Pro (2010) are extensive (and gorgeous!) didone families, the latter obtained from the former by optical thinning. Storm quips: I only hope that mister Justus Erich won't pull me by the ear when we'll meet on the other side. Advertised as a poster sans family, he offers Walbaum Grotesk Pro (2011). Wittingau (2016). 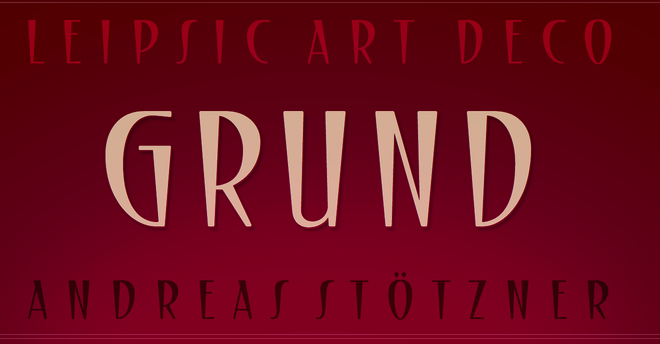 A wonderful decorative blackletter typeface family, with a great set of Wittingau Symbols. This foundry cooperates in its revivals with experienced Czech designers Ottokar Karlas, Jan Solpera and Josef Týfa. At ATypI 2004 in Prague, he spoke about his own Czech typefaces, on his Czech Typeface Project, and on the life of Josef Týfa. 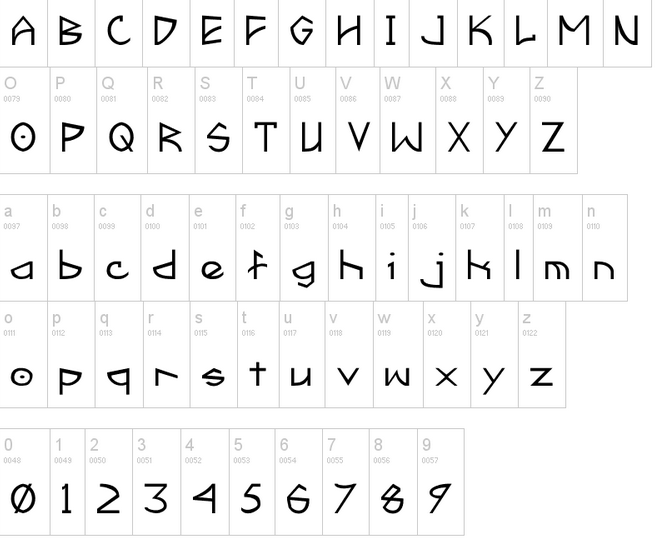 Alphabets Magical had freeware rune and old writing system fonts by Ben Whitmore from Auckland, New Zealand. 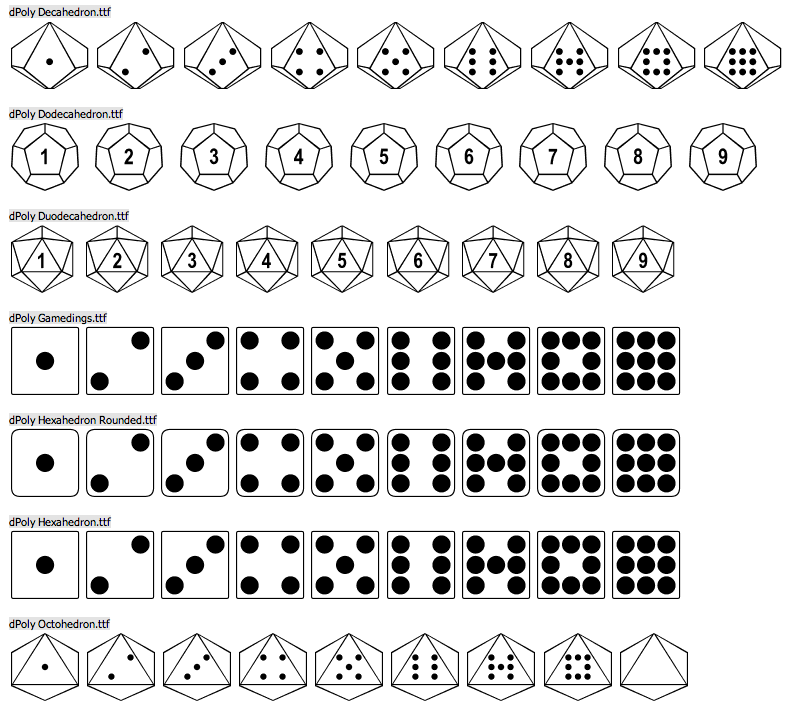 They included AngelicR100, BarddasWRR100, DaggersR100, IEFutharkR100, Malachim, PVEnochian100, PWRunesR100, ThebanBW100, AlphGeniiFzpg100, Enochian-Regular, PictSwirlR100. 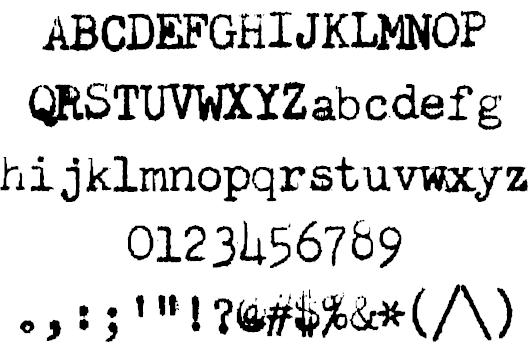 He also had Enochian-Regular by the Digital Type Foundry, 1991. In 2014, we rediscovered Ben Whitmore as The Briar. 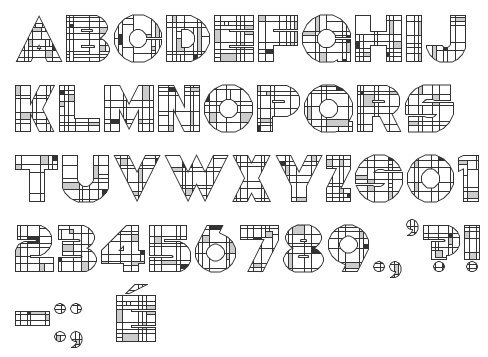 He published Coelacanth, a free typeface family inspired by Bruce Rogers' legendary Venetian typeface, Centaur, described by some as the most beautiful typeface ever designed. 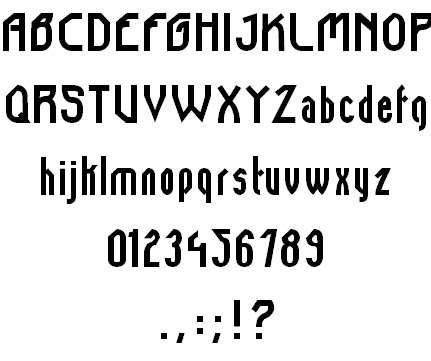 He writes: There are surprisingly few digital revivals of Centaur, and none that I know of providing the smaller optical sizes that were available in the original metal type. 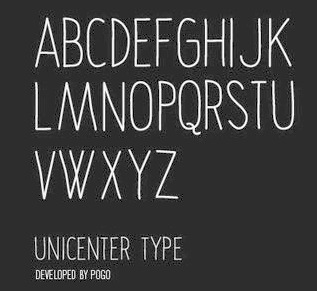 Centaur was tremendously versatile, as elegant and readable in the smallest caption text as it was at display sizes. 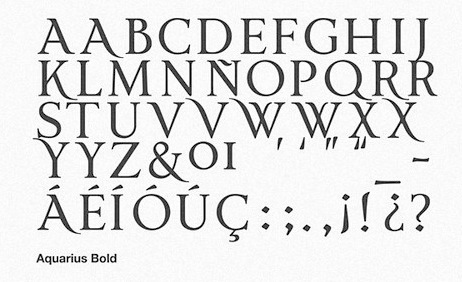 He created the italics from scratch. Interestingly, Coelacanth has six weights from Thin to Heavy, and six optical styles, 4pt, 6pt, 8pt, 14pt, 24pt and 60pt. CTAN link for downloading Coelacanth. Designer of Oxford Runes (2005). I could not locate that font on his site, which is now dedicated to photography. 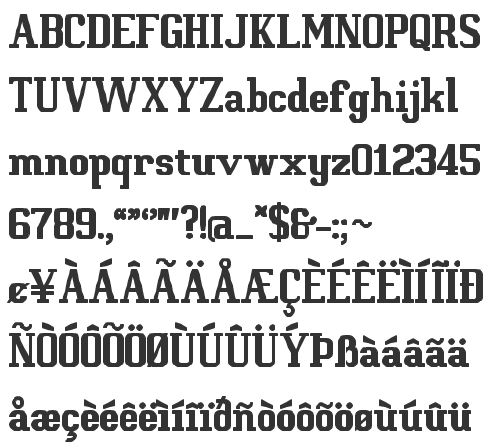 Tilman also runs the successful German / English font archive Fontasy.de. 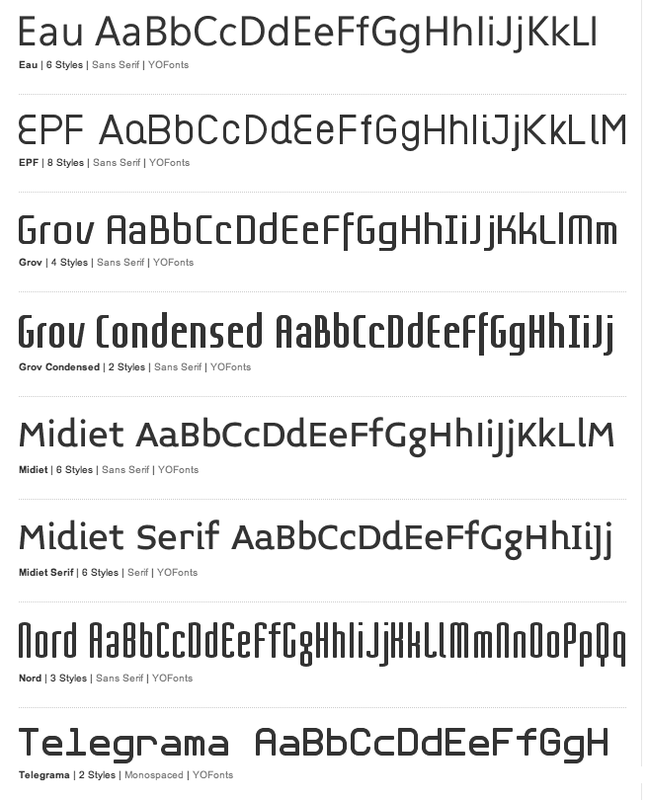 Tim Rolands (b. St.Louis, MO, 1970, based in Kirksville, MO and London, UK, but also in Stevens Point, WI) is an independent digital type developer, producing TrueType and Postscript typeface families for MacOS and Windows. He founded Tim Rolands Digital Design in 2001. Other names for his company include TR Typographic Services, Phont Typographics, Stylus Digital Typography, Studio Renaissance. 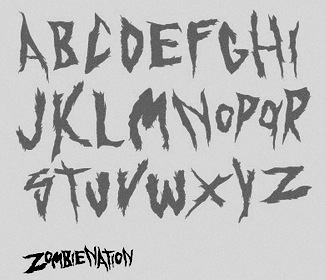 His fonts can be bought at MyFonts. 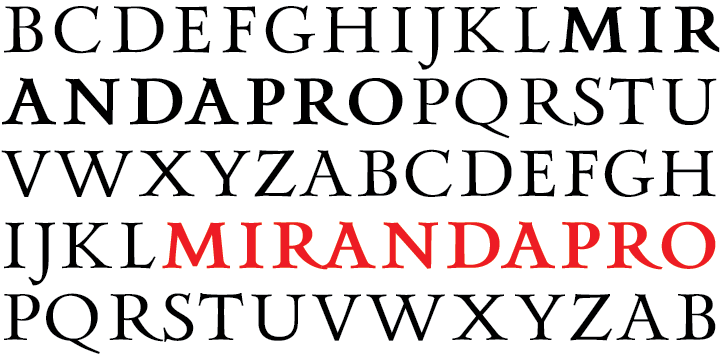 Tim's creations include Orlando (free), Anvil (also available in OpenType), Valor (2006, an experimental modern typeface that combines geometry and mediaeval Lombardic ideas), Miranda (an Aldine, roman caps family: Pro version appeared in 2012), Aegis, Prospero (1997, inspired by the early Romans of Nicolas Jenson; see Prospero Pro (1997-2008)), Illiad, Kimberly, Timotheus, Envoy (2001, garalde family), Odyssey (2001, classical Roman caps; see Odyssey Pro in 2017), Alexander, Runik Futhark (based on the earliest Germanic-Norse runes, known as the Elder Futhark). 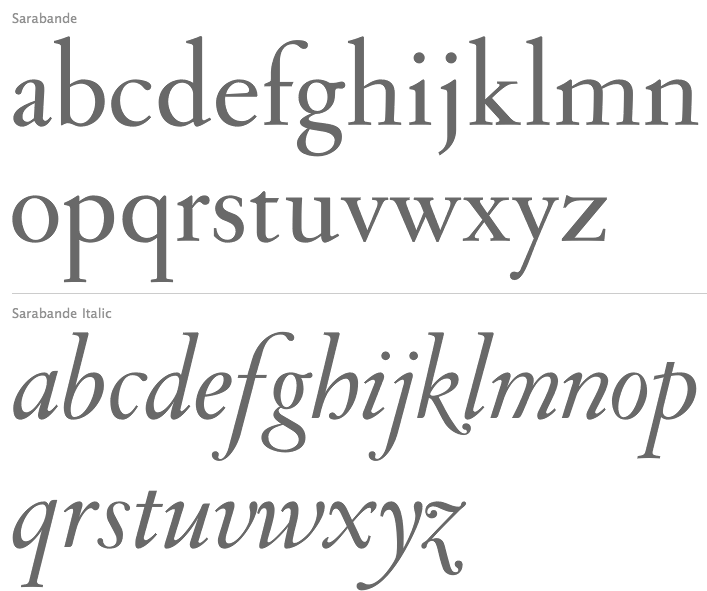 Old Style romans: Sarabande (1998; based on Jean Jannon's famous "Garamond" of 1621), Pavane (1998, based on a text typeface by Rudolf Koch), Philomela (2000, also at PsyOps), Montrachet (2002, Fountain: a garalde family), Monteverdi (Fountain: with Granjon's Plantin Ascendonica italic). 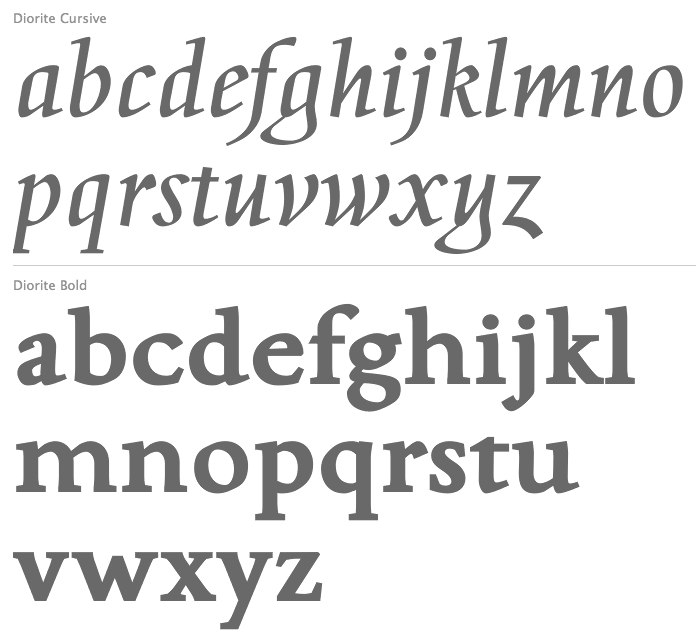 Baroque/transitional: Leyden, Leyden News (PsyOps, 2000), Baskerville 1757 and Baskerville Caps (1998; winner of a Bukvaraz award in 2001, available at Type Quarry). 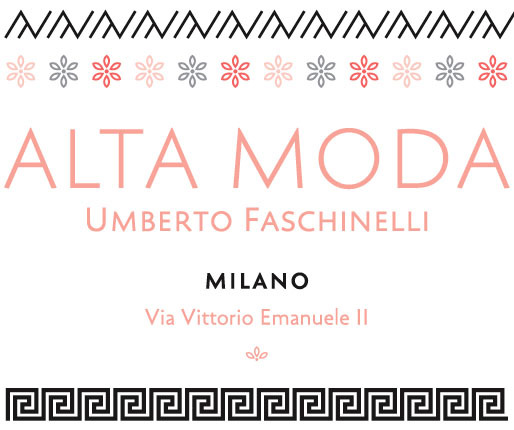 New Style Romans: Millennium, Eleonora (1999), Prospero (1998, a didone family), Waldstein (2003, Fountain: a Scotch typeface). 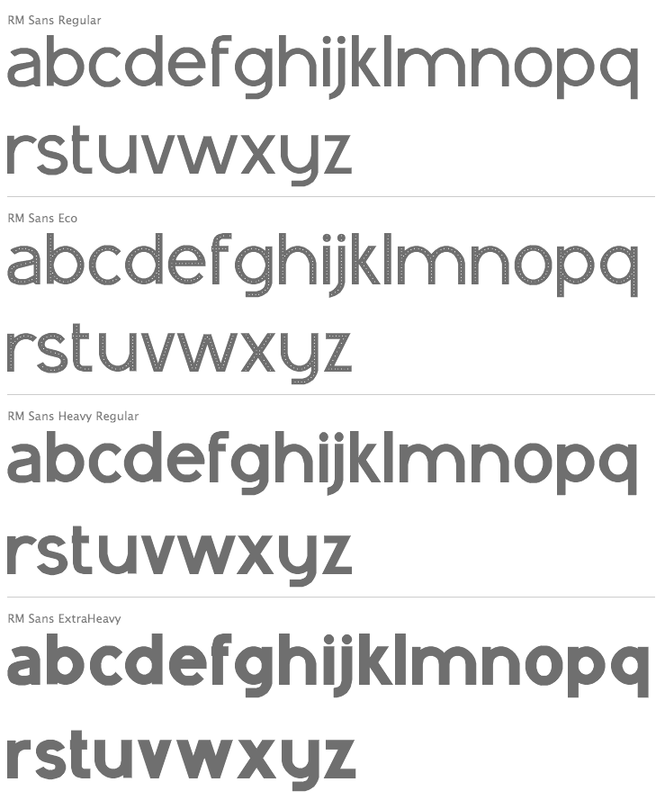 Sans typefaces: Millennium, Millennium Sans, Millennium Linear, New Millennium, New Millennium Sans and New Millennium Linear (2000). 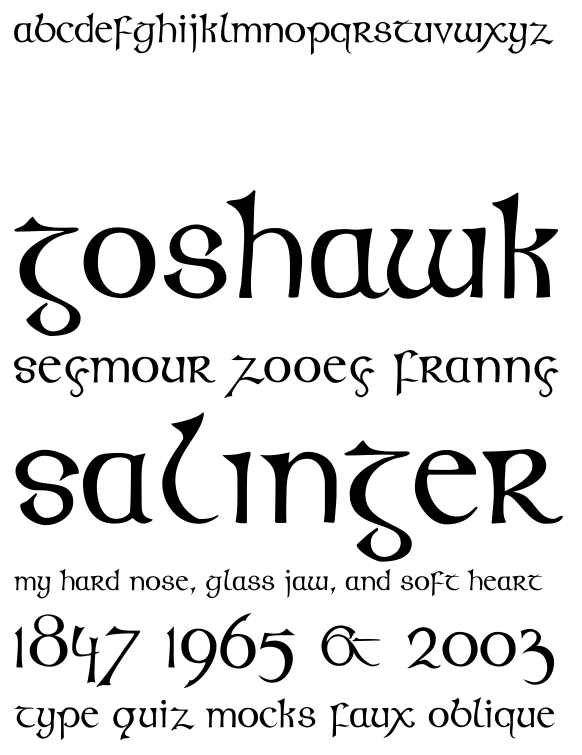 Display typefaces: Diorite (2005, a calligraphic angular family), Corsiva Italica (2003), Paracelsus (2003, Fountain: a modern version of Schwabach), Foliant Blackletter (German 15th C Textur), Zeppelin Bauhaus Gothic, Berserk Scandinavian runes, Escorial (at PsyOps), Paestum (2001, a Greek simulation family), Sekhmet (2000), Praetorian, Pressroom (2003), Proconsular, Palaestra (the latter three are inspired by informal, painted Roman wall writing), Triumphalis Caps (also inspired by Roman imperial inscriptions), Bucintoro (1999, a modern version of the rotunda blackletter), Midnight (2000; a neon light/ blackboard bold family), Karolin Fraktur (at Psy/Ops: Fraktur modeled after the Bible of King Charles XII, printed in Stockholm in 1703), Rococo Titling (2001, ornate titling caps based on work done by Jacques-François Rosart (1714-1777) and Pierre Simon Fournier (1712-1768), and the Renaissance family Ronsard (at PsyOps, 2000). 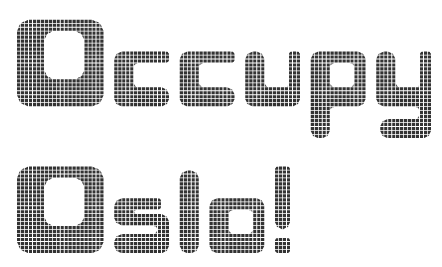 Late November (2008) is a transitional Antiqua-inspired type design made for text and display. 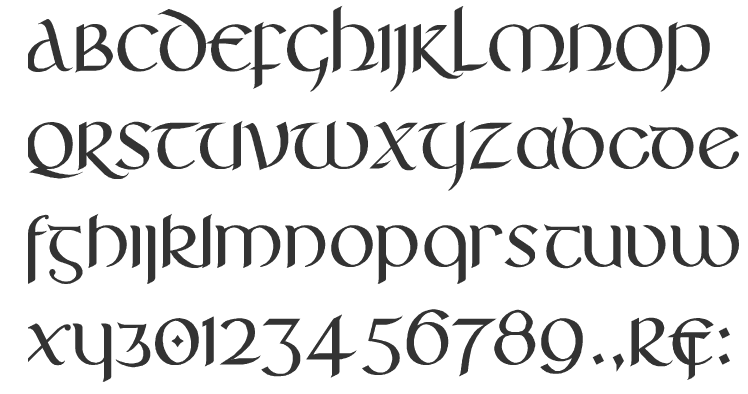 Hoy (2008) is a decorative semi-uncial font whose name derives from one of the Orkney Islands. 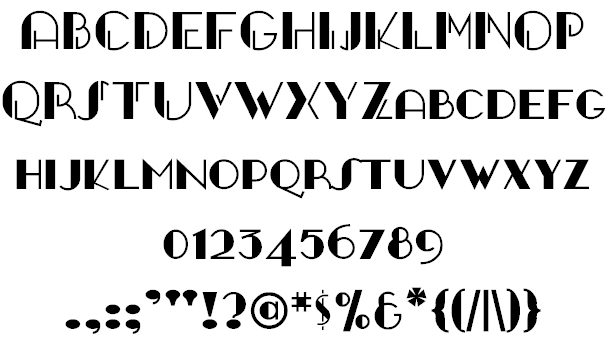 Spiggie (2008) is an art deco sans-serif, named for a Shetland beach. P22 Mai Pro (2009) is a new transitional antiqua. 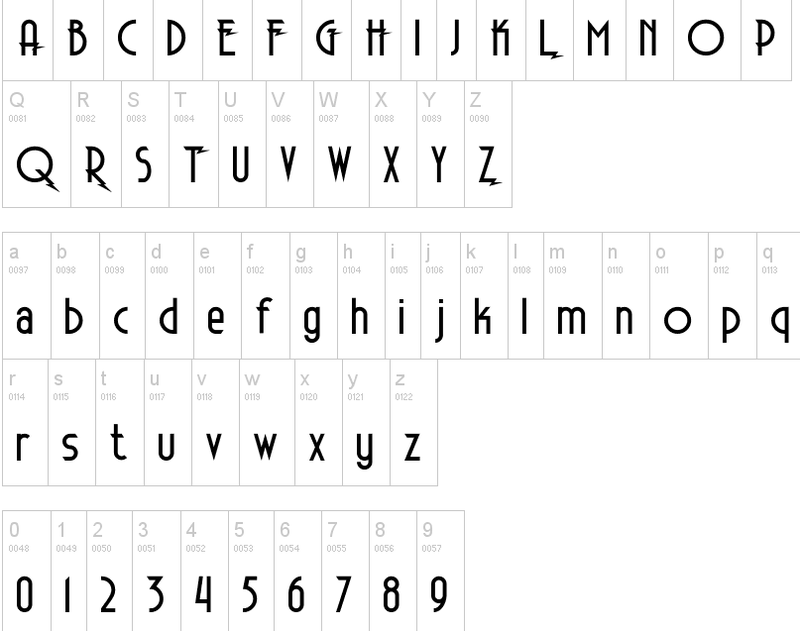 P22 Coda Pro (2009) is a simple slightly artsy sans family. 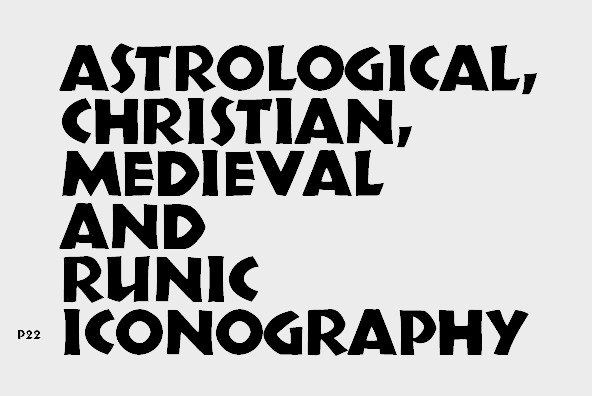 P22 Kirkwall Pro (2010) is a flared serif design. P22 Ornes Pro (2010) is inspired by the runic alphabet with ornamentation based on the woodcarvings of the Urnes Stave Church (Norway), an old wooden church dating back to 1150 CE. 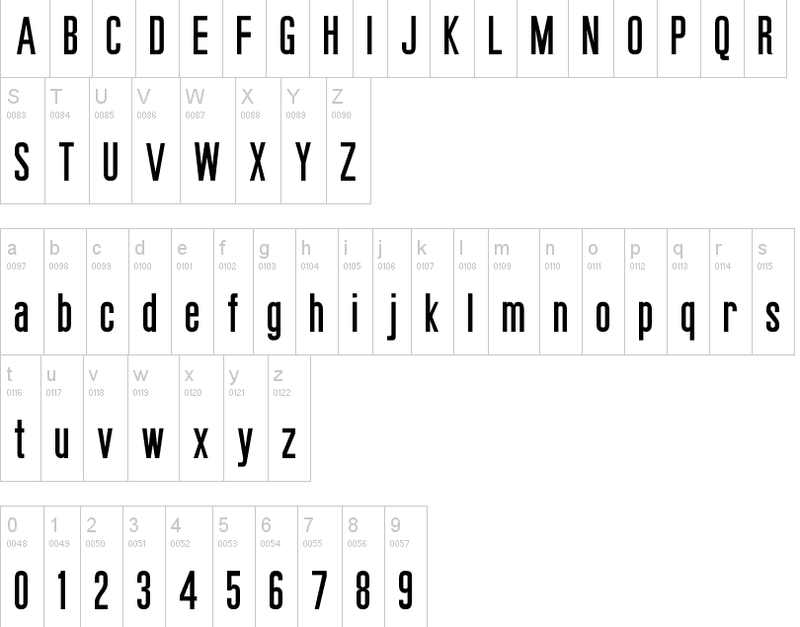 P22 Speyside (2010) is a round, curved and controlled sans serif with an additional set of decorated uppercase letters, initials and small caps. 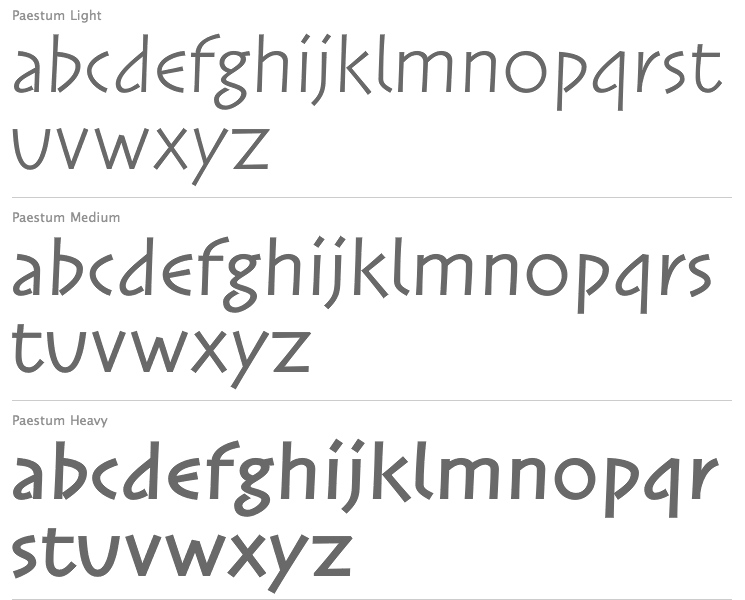 The font is inspired by the local handicraft at a small place in Tobago called Speyside, the batik in particular. 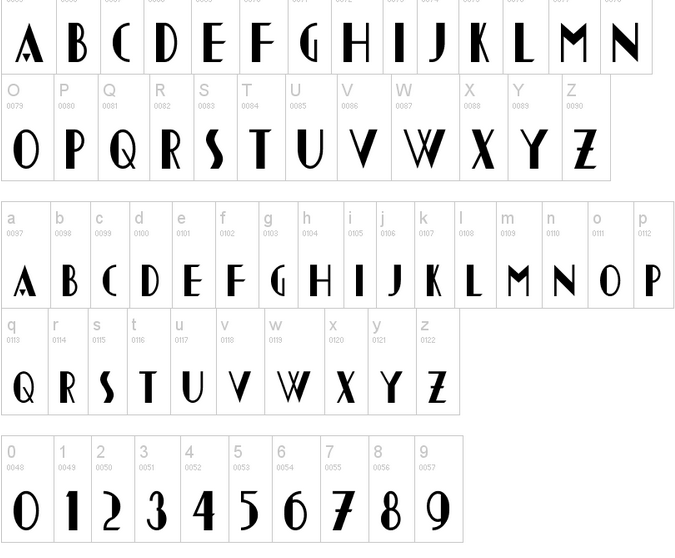 The delightful P22 Speyside Light Initials typeface is for fish lovers. 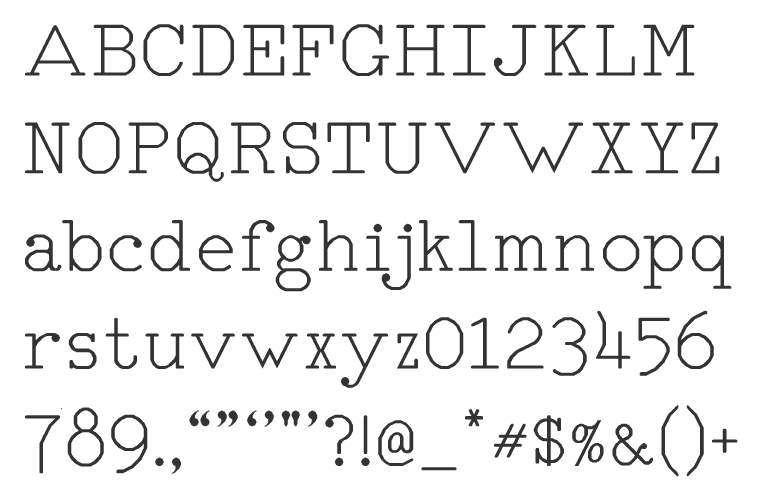 P22 Foxtrot and P22 Foxtrot Sans (2010) are large transitional families---the sans is really a hybrid with a serif, flared and all [not to be confused with any of the three older Foxtrot typefaces, by Ross Milne, Tom C. Lai or J. Marquez]. Ainabee (2016, P22). 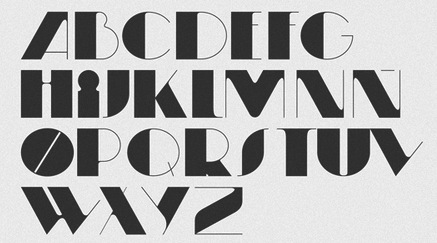 An art deco typeface family that has some stencil styles. 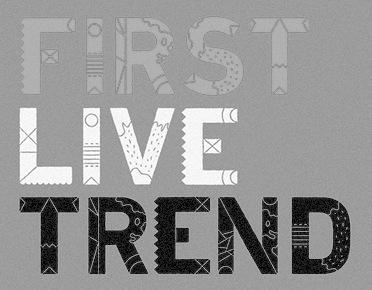 Travis Stearns (was: I am Mint Condition) is a graphic and type designer in Minneapolisa, MN. 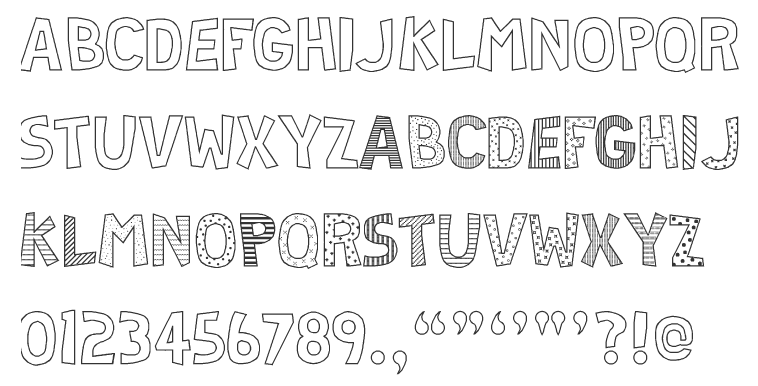 He created the hand-drawn Hugo typeface in 2008 at YouWorkForThem. 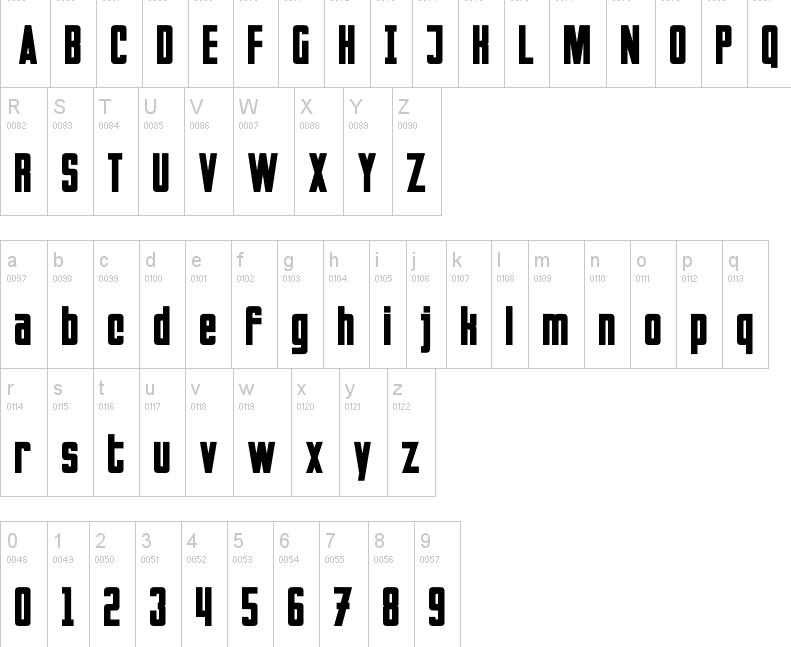 Other fonts there: Herzog (2008, fat experimental caps, with Taechit Jiropaskosol), Magoo (comic book style), Pineapple (2009, an art deco blackboard bold typeface), YWFT Morricone (2009, a great spaghetti western ultra slab serif with Italian features), Enigmatic Hand, Seaweed, Wellsworth Script (neurotic), Grosskopf (great fat poster font), YWFT Thinaire, Pierre (hand-drawn), YWFT Absent Grotesque (2008), YWFT Basel (2009, a cross of Spartan and Optima), YWFT Isanti (2010, neatly handlettered), YWFT Neighborhood (2008, an eroded vintage text font), Alexios (2010, a modular ornamental experiment), Odon, BLKMTL (runes), Garnier (child's hand), Fridge (hand-drawn outline face), Hannah (2009, three version of different widths; hand-set), Michel (2009), YWFT Motown (2009, a geometric slab serif), Valley (2009, a ball and stick-themed font), Skute (2009, free at You Work For Them, patterned after Cassandre's Bifur). 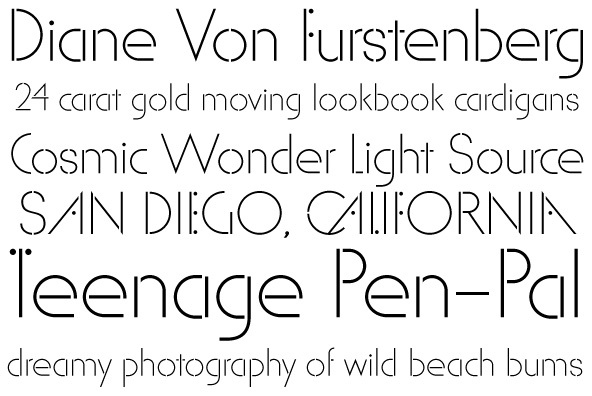 Typefaces from 2012: Valley (a ball and stick display face), Basel (Basel is a heavy sans serif font that began as a revival of the metal type Spartan Black, an American copy of Futura developed in 1936, but ultimately took on a character of its own during the process). Indonesian designer (b. 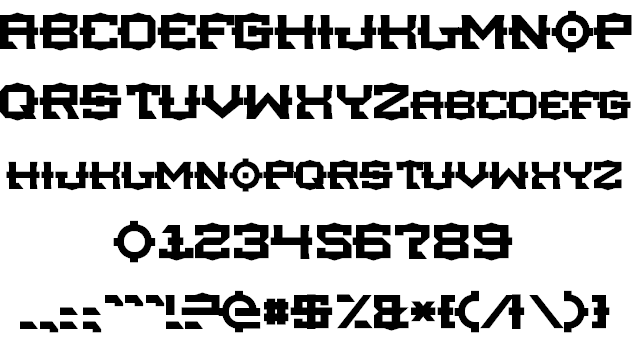 1995) of DAV Sets (2017: dot matrix), V-Insider (2017), BlockoBit (2017, pixel typeface), Shelter Code (2017, a pixel font) and Madeon Runes (2017). 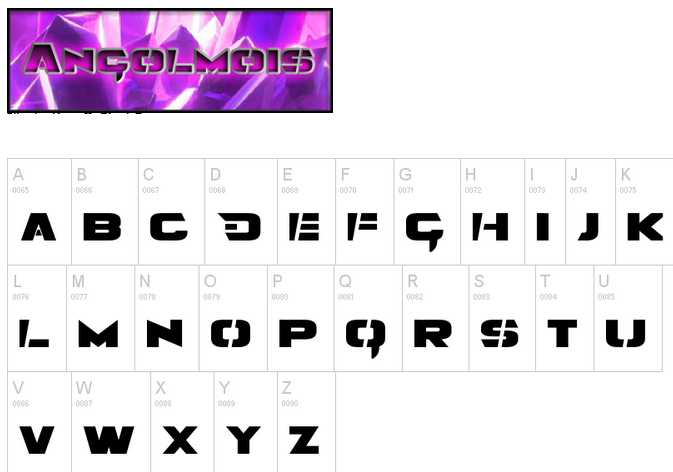 Both are based on fonts seen in the performances of the band Porter Robinson & Madeon Shelter. Australian Harry Pears (b. 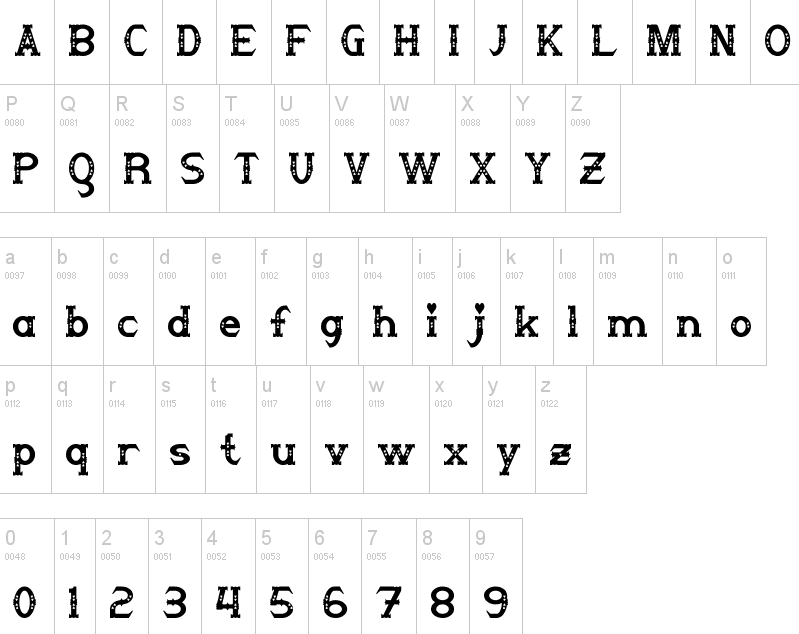 The Quirindi, Australia) is a veteran of the type world. He started his career as a colour camera operator and then as a phototypesetter. 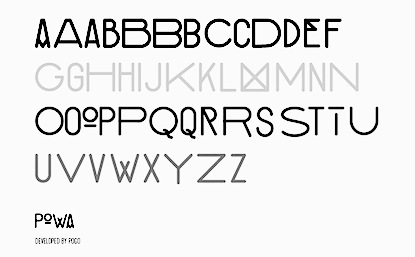 He started marketing digital typefaces in Australia, and has designed a few fonts himself. 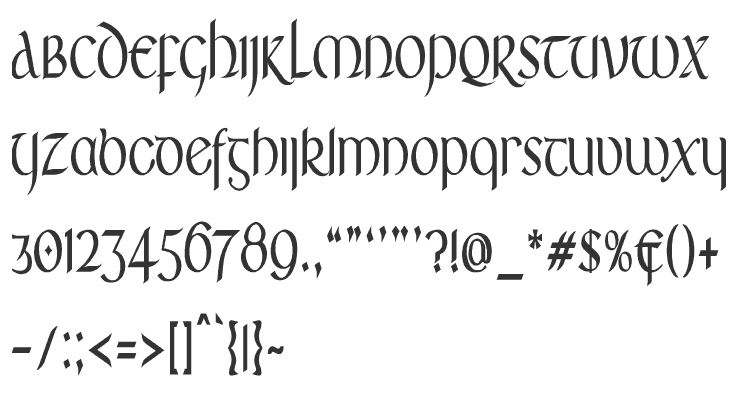 Creator in 2001 of the Celtic look family Lindisfarne Nova (with calligrapher Margaret Layson) at Bitstream (this includes Lindisfarne Nova Incised and Lindisfarne Runes). 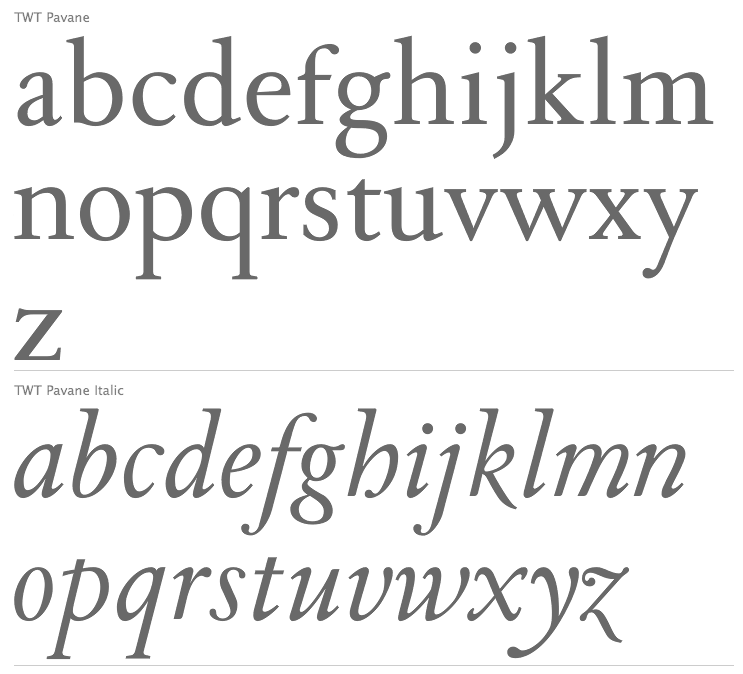 Harry is the owner of Typeface Research Pty. Ltd. of Lake Cathie, Australia. 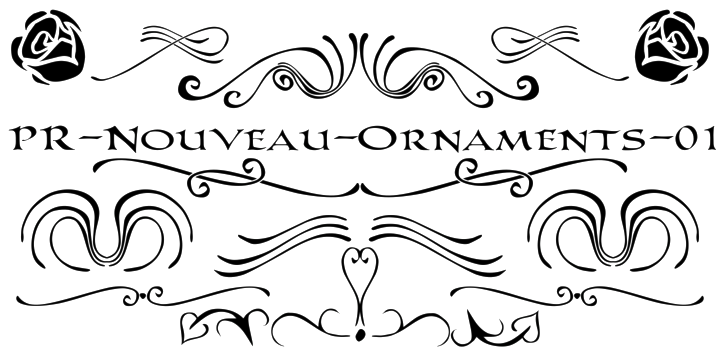 Author of Decorate with Type An encyclopedia of decorative and novelty fonts (2011), in which he proposes a new categorization of decorative types. Baltimore, MD-based foundry of Zach Risso (b. 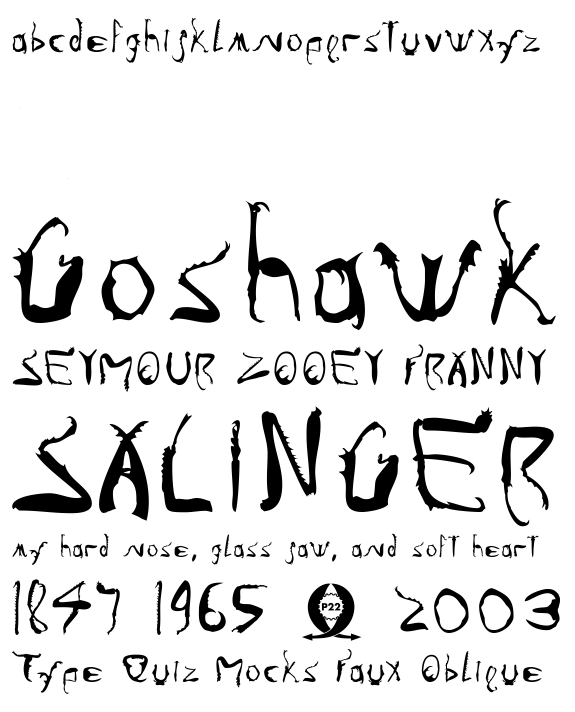 1988), an American novelist who is attended Maryland Institute College of Art for a BFA in graphic design. 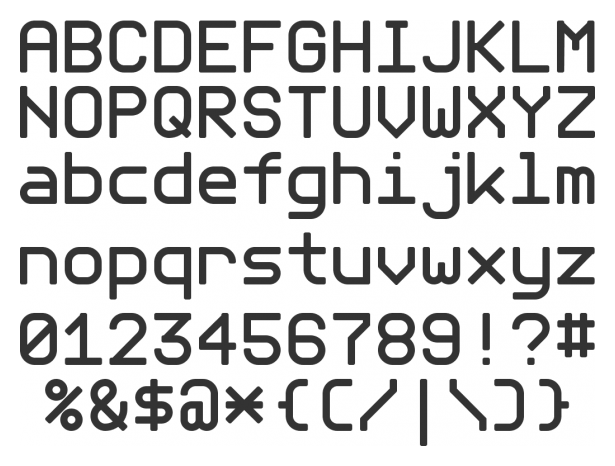 Risso designed the dot matrix typeface Found Receipt (2008), Schriftbild Grotesk (2008), and the rune typeface Elder Futhark (2008). 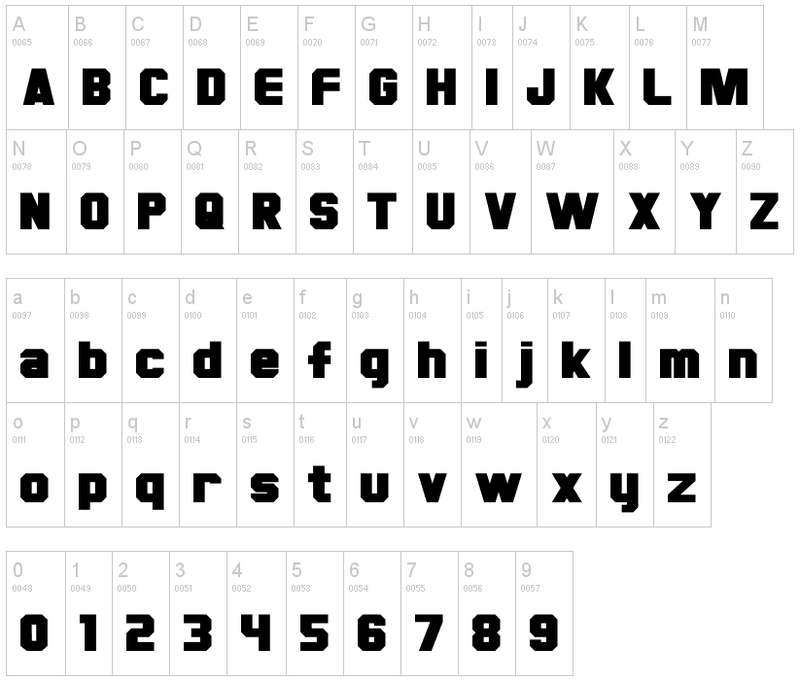 Berlin-based designer of Belgrad (2012, based on Futura, and inspired by German industry fonts from the late 19th century), Runes (2012), and Bukarest (2017, a semi-offical handwriting font). 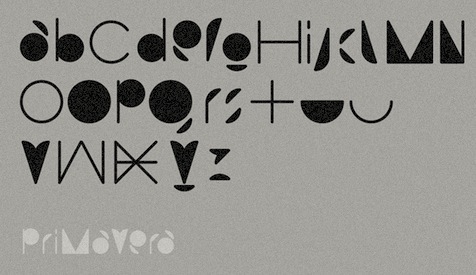 Pogo is a Buenos Aires-based design and art boutique established in 2008 by Ardi and Pampa. 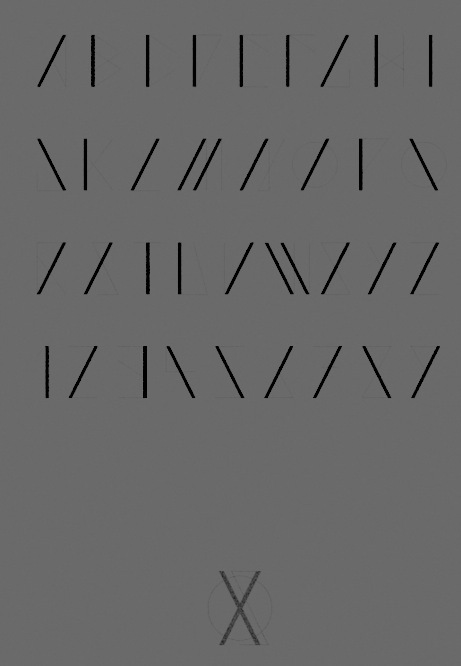 Creators of Know Type (2009, experimental), Zombienation (2009, graffiti), Primavera (2009, geometric experiment), Know Type (2010, geometric), Bufallo Type (2010), and Departure Type (2009, runic), Moonwalker (2010). Soko is an independent online magazine entirely designed and illustrated by POGO. 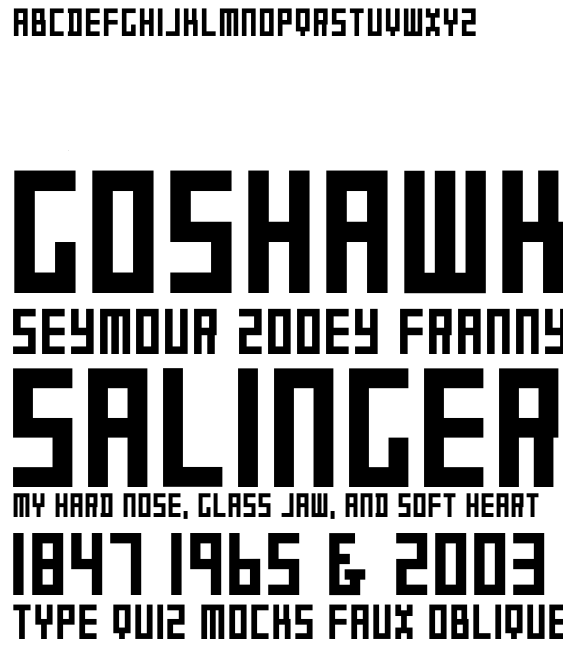 Scumbag (2011) is a Victorian wedge serif face. 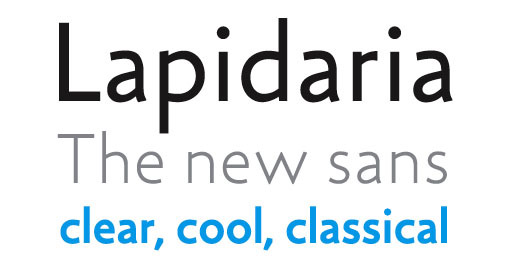 YOFonts offers beautiful fonts like Trafica and Engraver Sans by Yasuhiro Yamaoka. Most are commercial. Some can be downloaded as freeware or shareware. 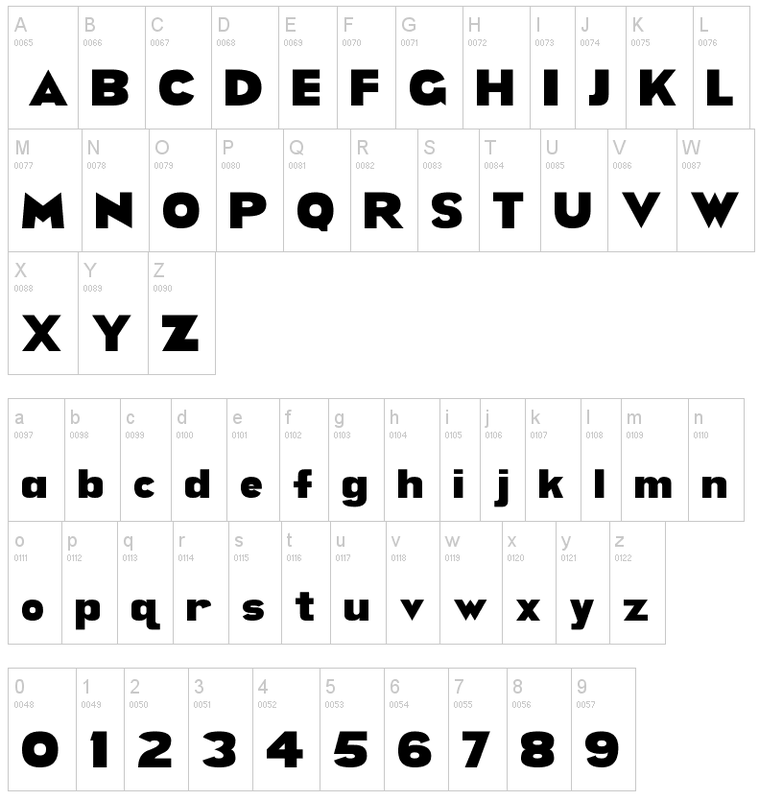 Fontsquirrel link [where one can download Eau (+Douce Sans, +Naturelle Sans, 2003), EPF (1999-2006), Grov (2000-2002), Midiet (1990-2009, sans and serif), Nord (1992-2000, elliptical), and Telegrama (1992, pixelish)]. 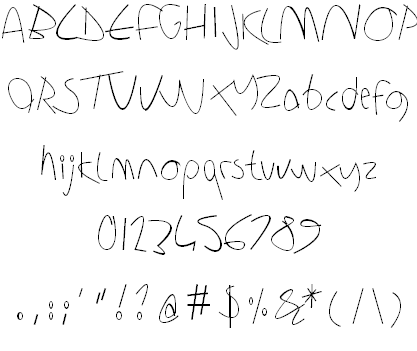 Freeware fonts (Mac/PC): Crematec Bold, Glyphian (runic), Grov Alphabet Regular / Italic / Condensed (1999), Grov Katakana, Grov Hiragana, Laitty (1993-1997, upright connected script), Lapidit (1994-2002, experimental), Liq (1995, LCD face), IgnorantModern (1993), Initia (geometric, circular), OneZero Alphabet, OneZero Katakana (pixel face), Ovals (border font), Quads (borderfont), SmooHG, SmooKK, Opuscula (2008-2011), Practica, Ovals Regular (Border font), Quads Regular (Border font). 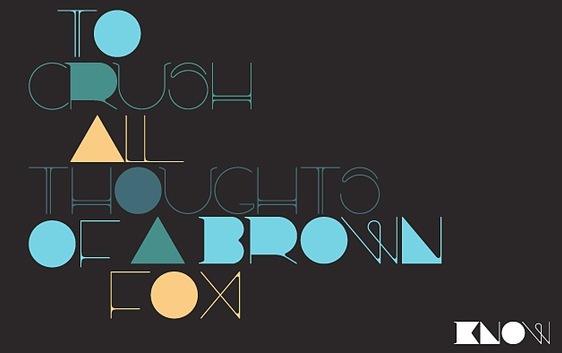 Font of the month (free): Philo AB, Philo KK, Philo HG. 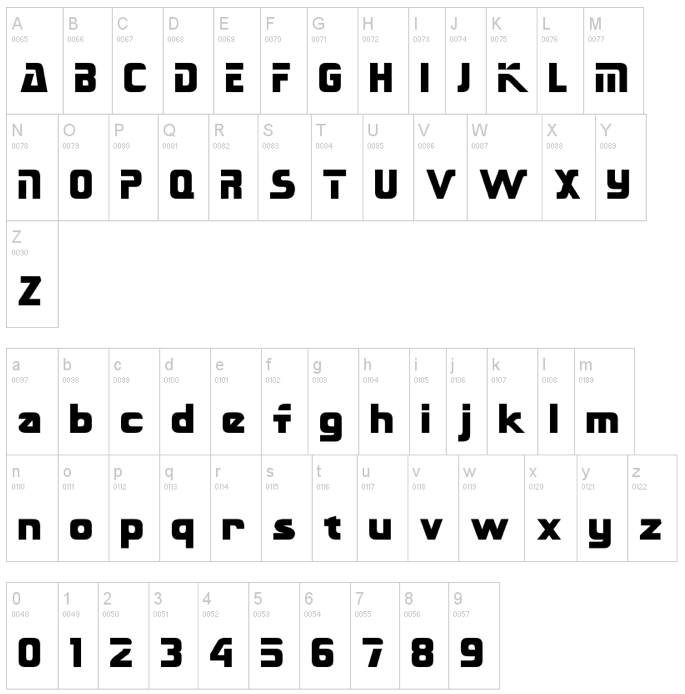 Other fonts: Angrite-Regular (1998), ArchaeoDeco (2001, art deco), Botaniq (organic, 2001-2002), Circles, CremSBold (1995-1997), CremacBea, CremacBeaBold, Crematec (techno), Cybertalk (2000), DippleKKS (1998, organic, molecular), Elementa (1990-1998, a techno family in Sans, Serif and Script styles), Engraver Sans (1995, Greek simulation family), Fact (1995-2005, information design family), Fol (1995, octagonal family), LiqMono, LiqMonoOblique, LiqRegular, LiqRegularOblique, ModCircle (1995), ModQuad (1996), Moderno (1997-2002, sans), Philo (1995-1996), Pica (1993-2005), Pixe (1992-1998), Practica (1991-2002, +Practica MsF), Nord-Bold (1998), OneZero-ABOneZero (1998), OneZero-ABZeroOne (1998), OneZero-ABZeroZero (1998), OneZero-KKOneOne (1998), OneZero-KKOneZero (1998), OneZero-KKZeroOne (1998), OneZero-KKZeroZero (1998), Serian (1997-2005, a German Schreibschrift), Trafica (1999-2002). 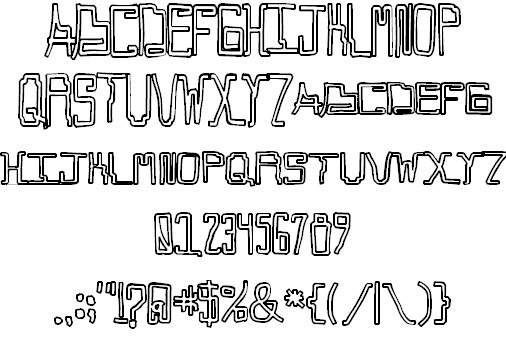 In Font Pavilion 12: Smoo (1997-1998, Latin, katakana, hiragana).